As children of the 1980’s, we vividly remember the Walt Disney Company’s partnership with the now defunct Premier Cruise Lines and their famous “Big Red Boat.” Who can forget those classic commercials? Premier Cruise Lines is no longer the “official cruise line of Walt Disney World” as Disney Cruise Line (“DCL”) officially launched in July of 1998 with the maiden voyage of the Disney Magic. As lovers of all things Disney, and frequent cruisers, we’re not sure why it took us so long to finally set sail with Disney Cruise Lines. 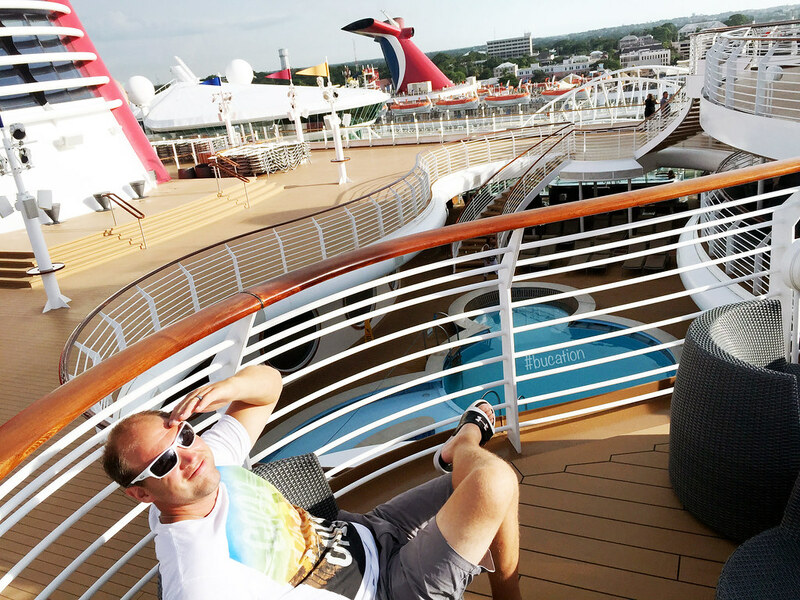 We can remember the launch of the Magic followed by the Wonder, but it wasn’t until after DCL launched the Disney Dream in January of 2011 that it seemed everywhere we went people were absolutely fanatical about Disney Cruises. In 2015 Condé Nast Traveler readers ranked the best cruise lines in the world with Disney Cruise Lines at number one. 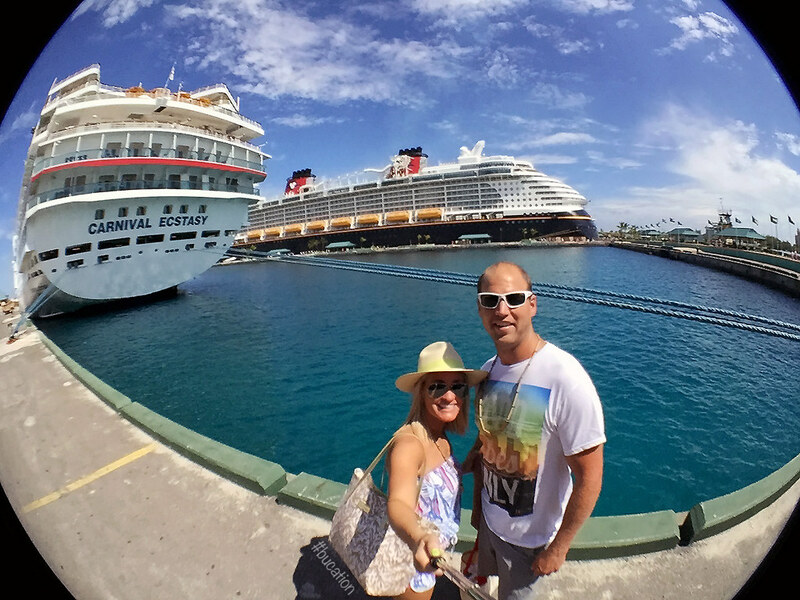 It became abundantly clear to us that there was no time like the present to embark on a Disney Cruise. 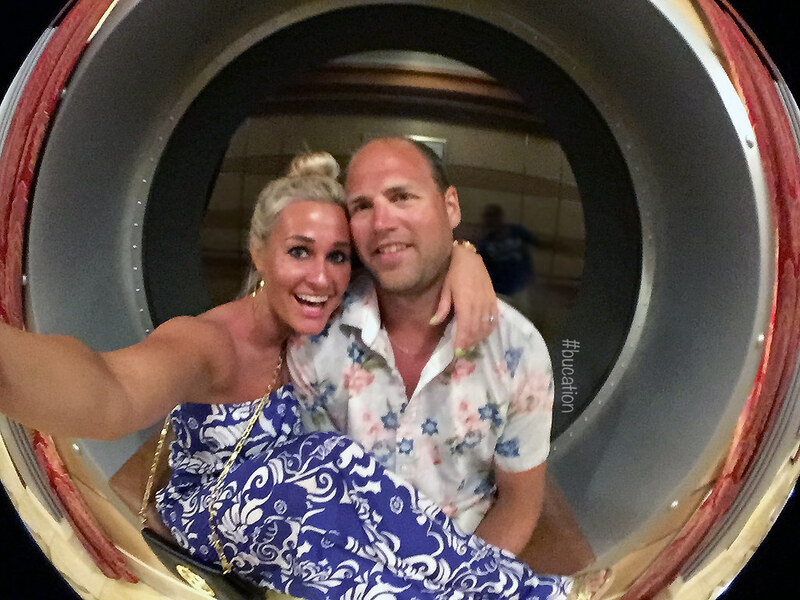 To The Bahamas And back! 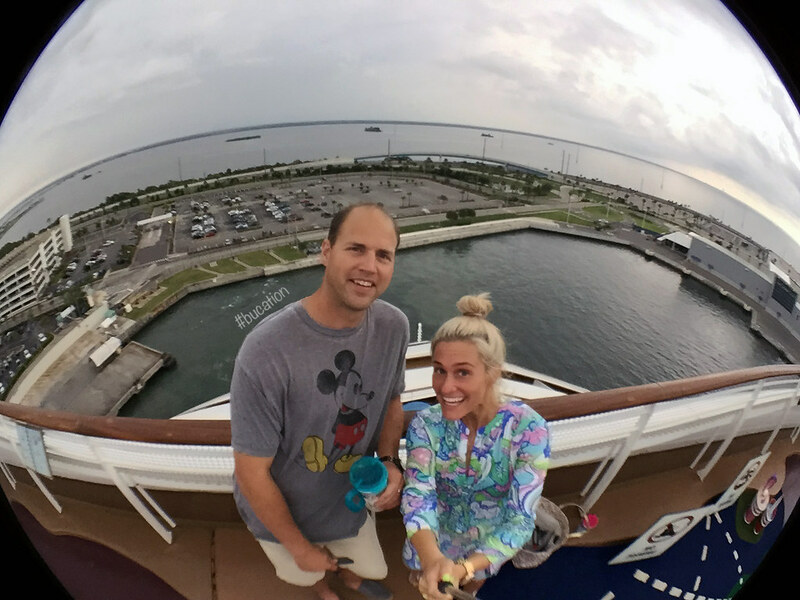 For our maiden voyage on Disney Cruise Line we decided on a three night/four day sail aboard the Disney Dream to the Bahamas and back. 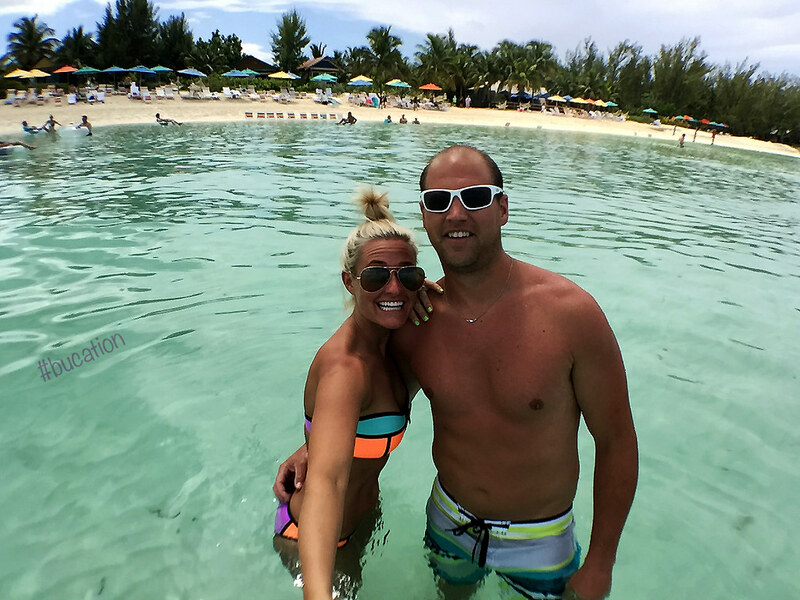 Our itinerary included a stop in Nassau, Paradise Island as well as a stop at Disney Cruise Line’s exclusive private island Castaway Cay which is also located in the Bahamas. 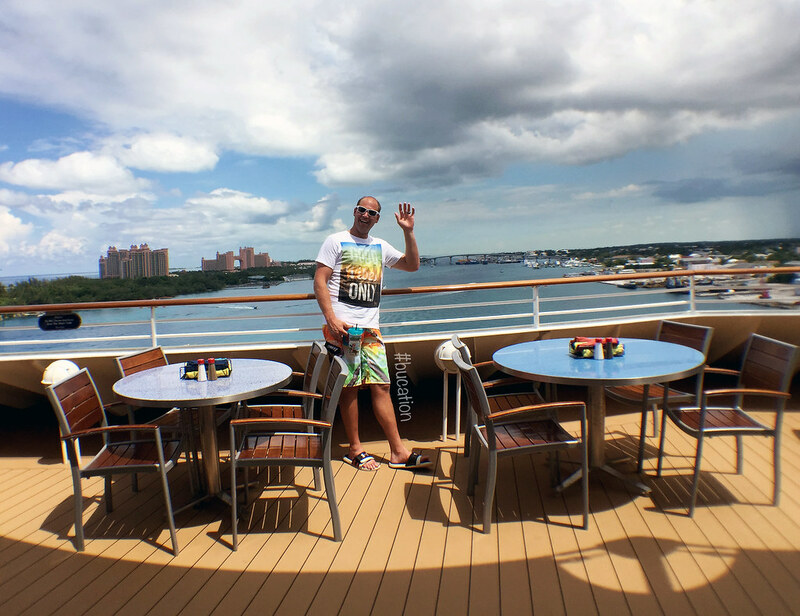 Although we have cruised to the Bahamas in the past, we have not been to Castaway Cay which is the stop we were most looking forward to on this itinerary. Obviously, cost is relative, and we would have to strongly disagree with this statement. We’ve disclosed the cost of this particular sailing above, and of course there are more affordable staterooms and itineraries depending on the time of year you prefer to sail. However, it should be known that Disney Cruise Line offers a variety of inclusions that we have yet to experience on other cruise lines. The level of superior service we received, the amount of included onboard amenities (free childcare! 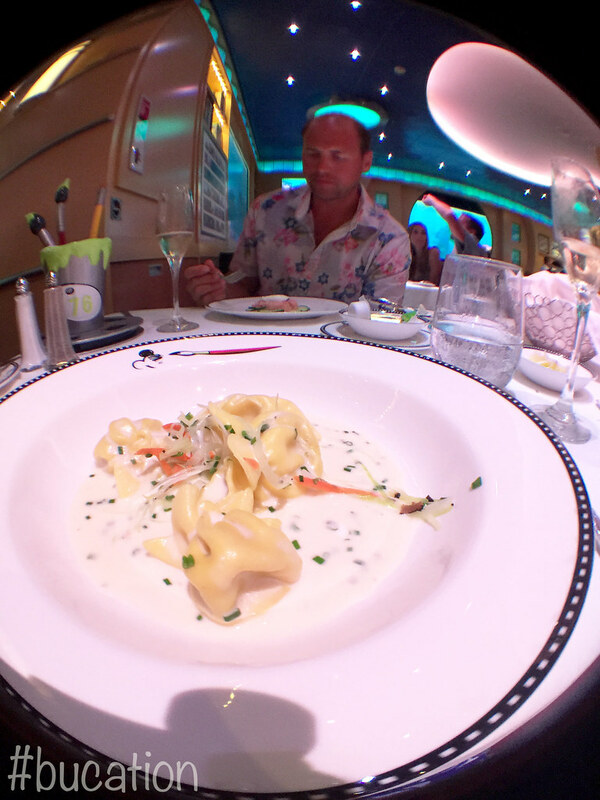 ), the quality of outstanding food offerings, and the unique dining opportunities with rotational dining on the Disney Dream far surpassed any of our experiences on other lines. Board Early, Beat The Crowds! When completing Disney Cruise Line’s Online Check-In, you have the option to choose between a number of assigned boarding groups for embarkation based upon your party’s anticipated arrival time. The cruise terminal itself officially opens at 11:00 a.m. and final boarding ends at 4:00 p.m. on the majority of DCL’s sailings. 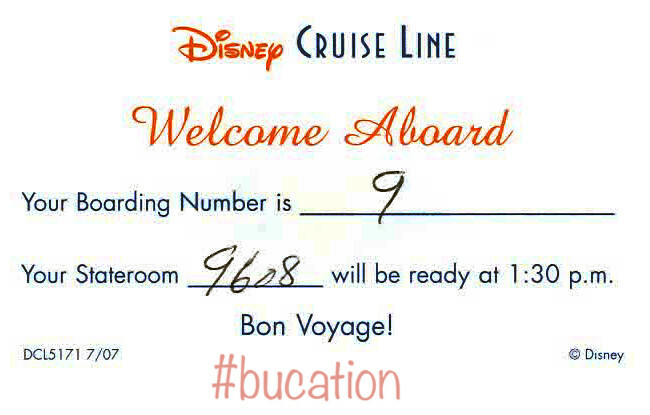 We selected the earliest boarding group that was available (11:00 a.m.) since we planned to arrive in Port Canaveral the evening prior to our cruise’s departure. 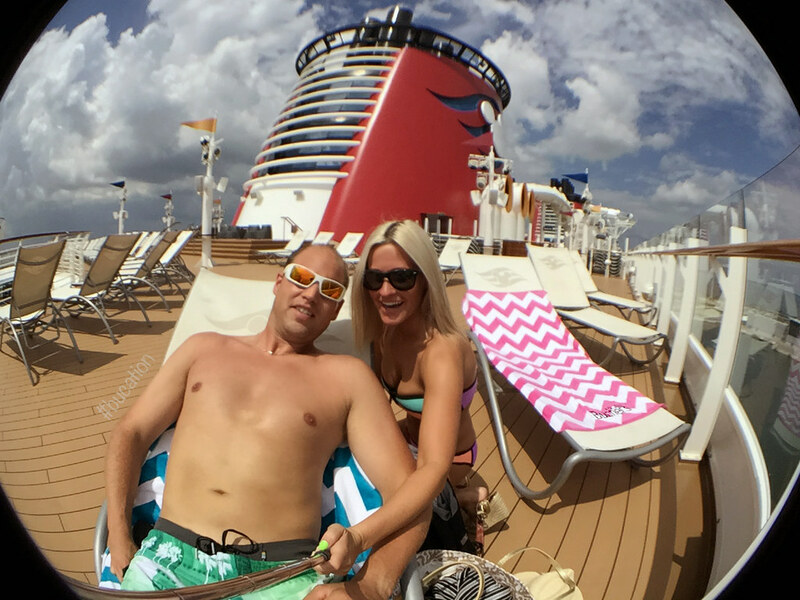 With this being our inaugural Disney Cruise, we wanted to arrive early and spend as much time enjoying the ship as possible. While onboard we were able to watch as the crowds flooded the terminal courtesy of their personal vehicles, Disney’s Magical Express buses, and through a number of other private car and shuttle services. As we watched the crowds flood the port terminal throughout the afternoon, we were so happy we beat the lines with our early embarkation. 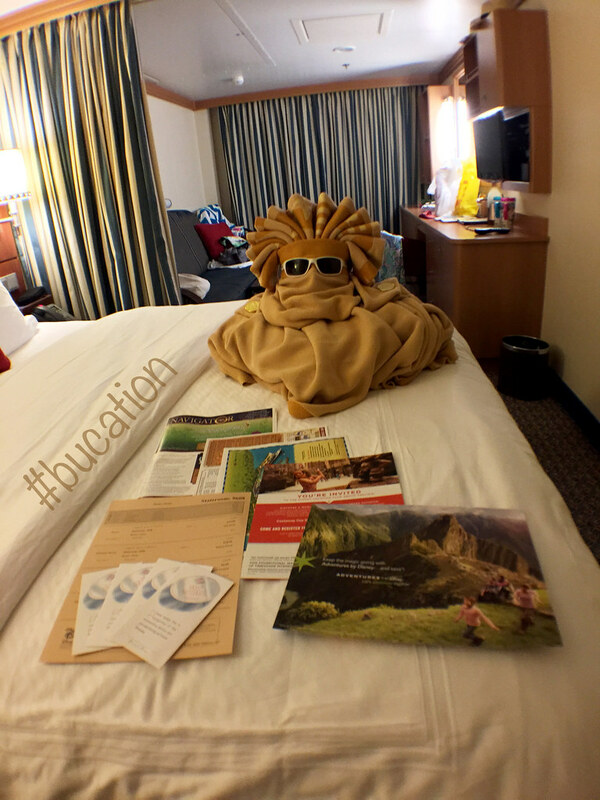 For our pre-cruise accommodations, we selected The Holiday Inn Club Vacations Cape Canaveral Beach Resort. Although there are not many lodging options near the port itself, this resort met all of our needs since we were arriving after midnight and departing mid-morning. This is not your typical Holiday Inn, so please do not let the name fool you. The property is formerly known as the Ron Jon Cape Caribe Resort. It is a 10-acre full service timeshare resort. Our one bedroom villa featured a small living area with a pull out sofa, a king size bed, and a small kitchenette with a mini refrigerator. This may sound silly, but the bathroom was the highlight of our room as it offered double sinks, a full size whirlpool tub, and a separate shower. All of this was certainly more than we needed for our short stay, but still very nice. 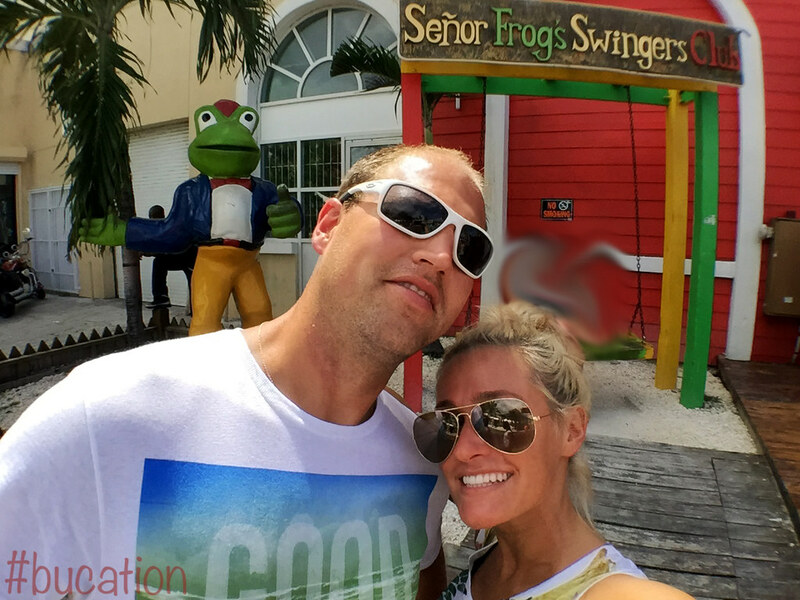 Although we were at the resort for less than twelve hours, we really enjoyed our time at the Holiday Inn Club in Cape Canaveral. The only downside to this massive resort was that it did not feature a breakfast option prior to 11:00 a.m. There are a number of dining options in the resort itself, however their hours are from 11:00 a.m. – 10:00 p.m. However, this gave us the opportunity to explore the area in search of breakfast, and we settled on a quaint cafe about a mile walk from the resort. Another downside to the resort was transportation to the terminal itself. Even though you are so close to the terminal while at this resort, you still must find transportation into the cruise terminal gates themselves. 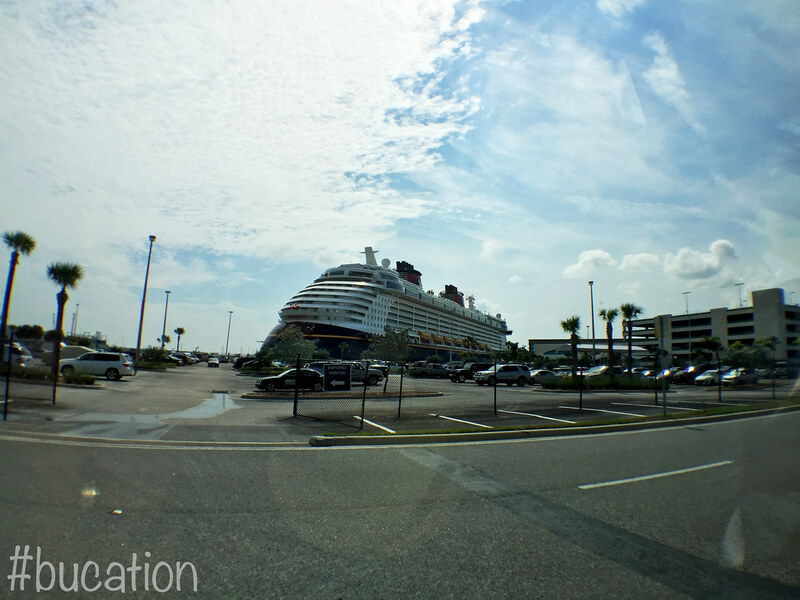 The resort partnered exclusively with a private shuttle service, Happy Hour Shuttle, for the short ride from our hotel in Port Canaveral, and we arrived at Disney Cruise Line’s private terminal in the port with little to know traffic. The cost of the shuttle for both of us was $20.00 total. If you do decide to stay at the Holiday Inn at Cape Canaveral, please be sure to sign up for the shuttle service as soon as you arrive at the hotel. This was not something that was shared with us, and had there been more guests heading to the terminal, we may have had to wait quite a while for port transportation. We arrived curbside at DCL’S private cruise terminal, and we were directed through a small security line inside where we were then ushered up the escalators to cruise check-in. Since this was our first cruise with Disney Cruise Lines we checked-in with the rest of the first timers, but again there was little to no wait during our early morning check-in. Our check-in attendant was extremely helpful, sweet, and also happened to be from our home state of Pennsylvania which made our time together very pleasant. Once we received our “Keys to the World” cards, which were very similar to what you receive when checking-in at a Walt Disney World Resort, we were assigned a boarding group number which we were told would be announced momentarily. 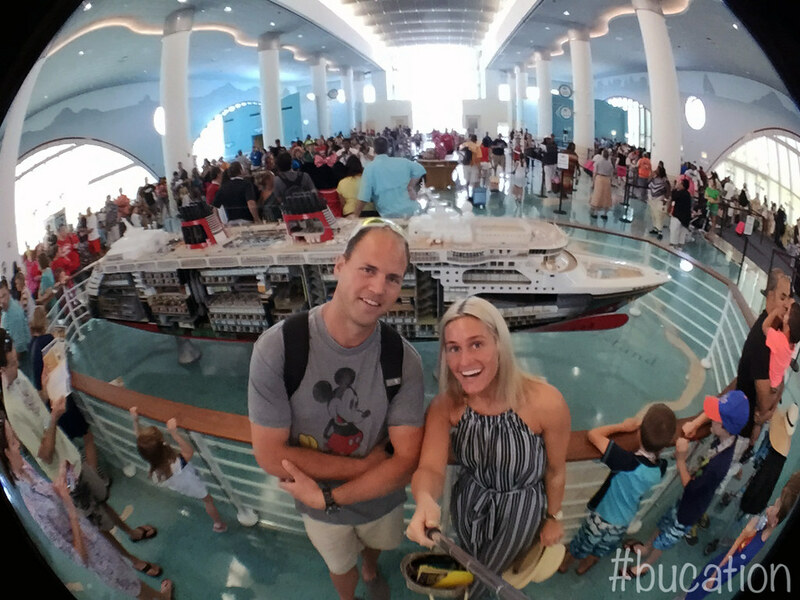 It wasn’t long after we checked-in and snapped a few photos in the terminal before our boarding group was announced and we were finally boarding the fabulous Disney Dream! 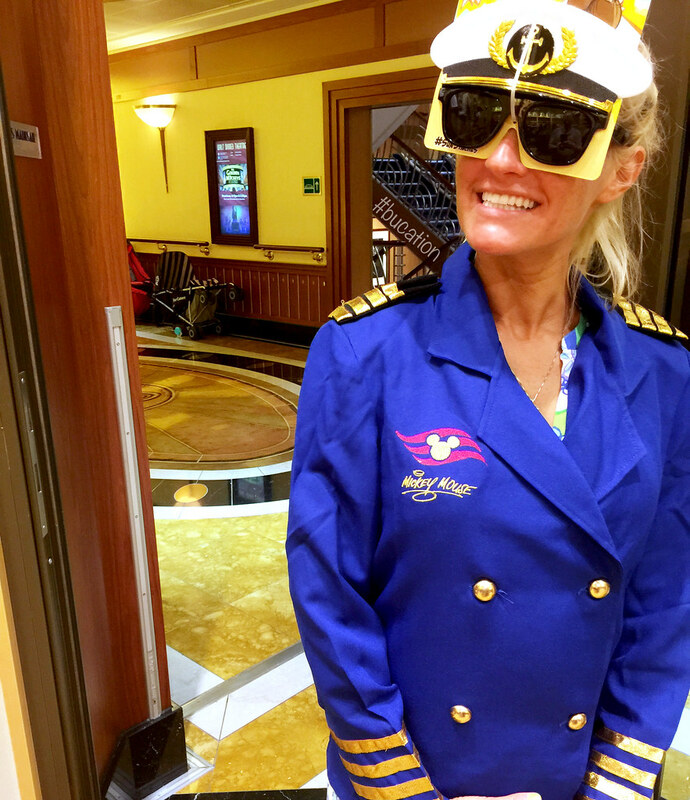 Shutters (the onboard photography service, much like Disney’s Photopass service, offered in their Parks & Resorts) offers the opportunity to have your photo taken on the gangway as you board the ship. There are two lines for this service which can move slow or fast depending on the varied poses requested by the guests ahead of you. However, there is also an additional third line that allows you to bypass this photo option completely. 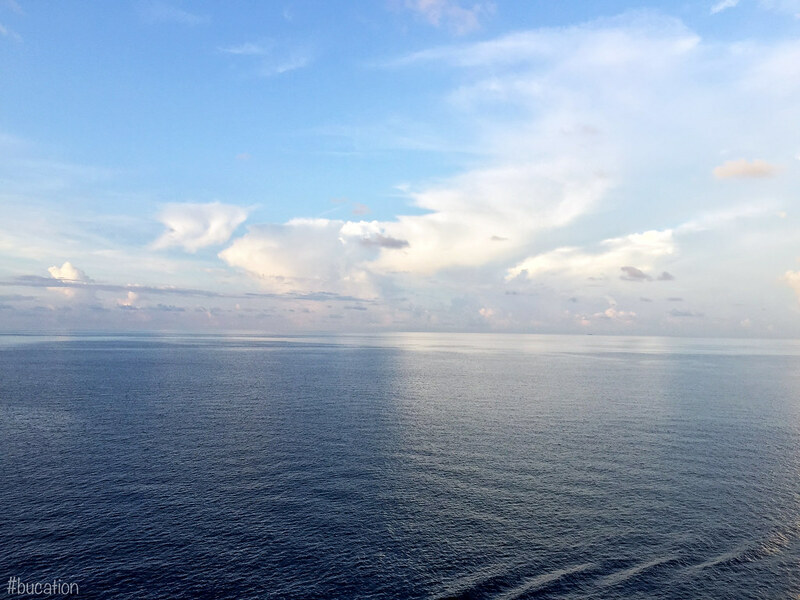 We recommend bypassing this option if you do not plan to purchase this photo during your cruise, or if you are in a hurry to board and start your journey. After you board, snap a photo of your own in the main lobby which, in our opinion, is far more photogenic than the stock blue Disney Cruise Line background offered by the Shutters photographers at this particular photo stop. 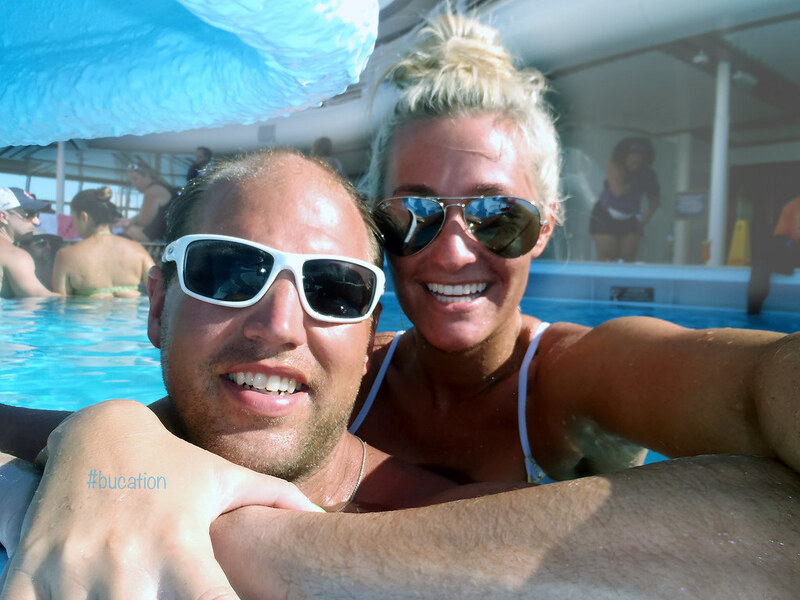 After we boarded, we began making our way to the pool deck. Since there are a number of people boarding at the same time, and through the same entry point, the main elevators near the lobby atrium are rather busy. The midship staircase was a better option for us in contrast to the long lines for the crowded elevators, but be warned it is a long way up if you aren’t a fan of stairs! 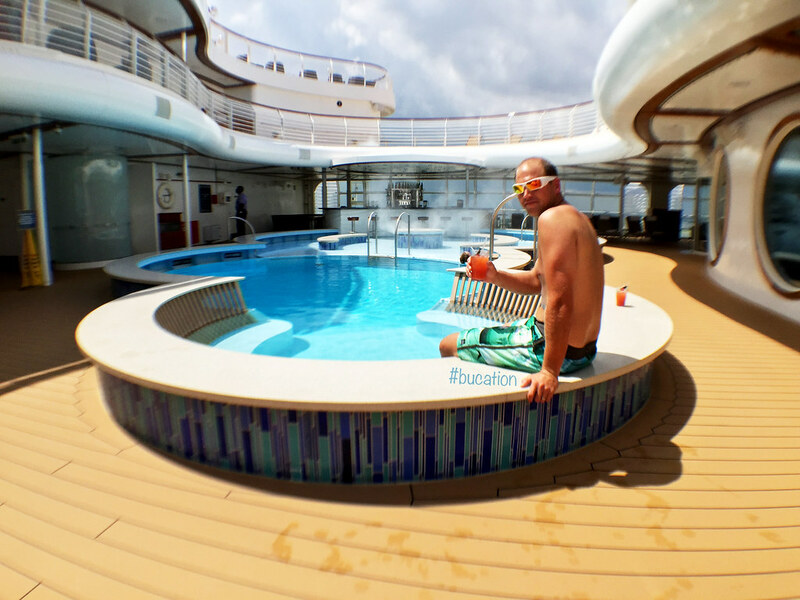 When we arrived at the pool deck (deck 9), it seemed everyone else who had already boarded had the same game plan as us. The “family zone,” which included Donald’s family pool, Mickey’s kids pool and slide, the two refreshment stations, and the three quick service food options at Flo’s V8 Cafe were filling up fast. We decided to make our way to the adults only area known as “The Cove.” To our surprise, we found our selves alone in The Cove. We had the pool, bar, and both lower and upper decks of lounge chairs all to ourselves. An attendant was stationed nearby to provide anyone who enters this area with clean pool towels, and two towels were already neatly folded and placed on each of The Cove’s beige loungers for use. The bar tender was ready and waiting to serve us the fantastic drink of the day, which was a Bahama Mama. We couldn’t disagree with this travel myth more! It’s no secret that if you have a family, a sail on a Disney Cruise Line ship would be an excellent choice for your next family holiday. 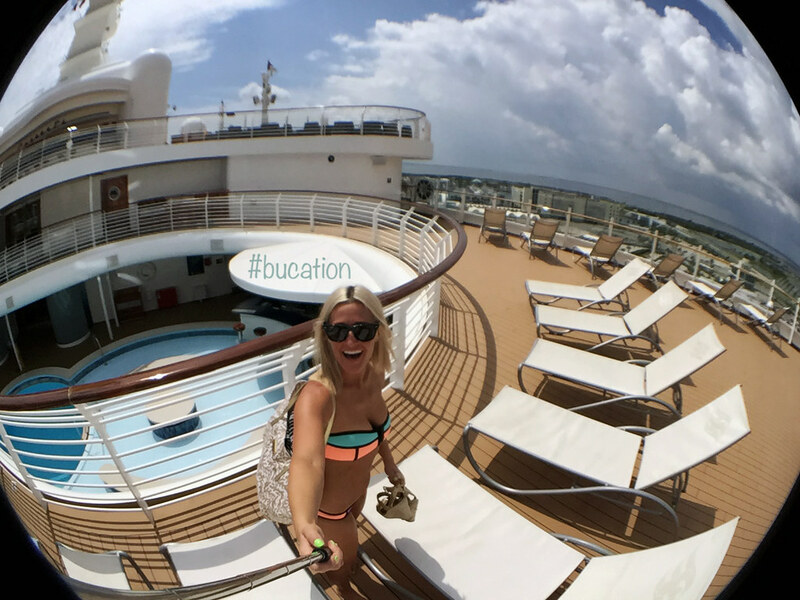 However, it should be known that no one does adults-only better than Disney Cruise Lines. Adults can spend a day pampering in their world class spas, relax in one of the multiple adults-only areas on-board or on their very own private beach in Castaway Cay, or even enjoy a romantic meal at one of DCL’s specialty restaurants. We cannot express how delightful it was to spend an entire afternoon in The Cove all while having this area completely to ourselves. On our first afternoon, The Cove bar and pool was our own private paradise. 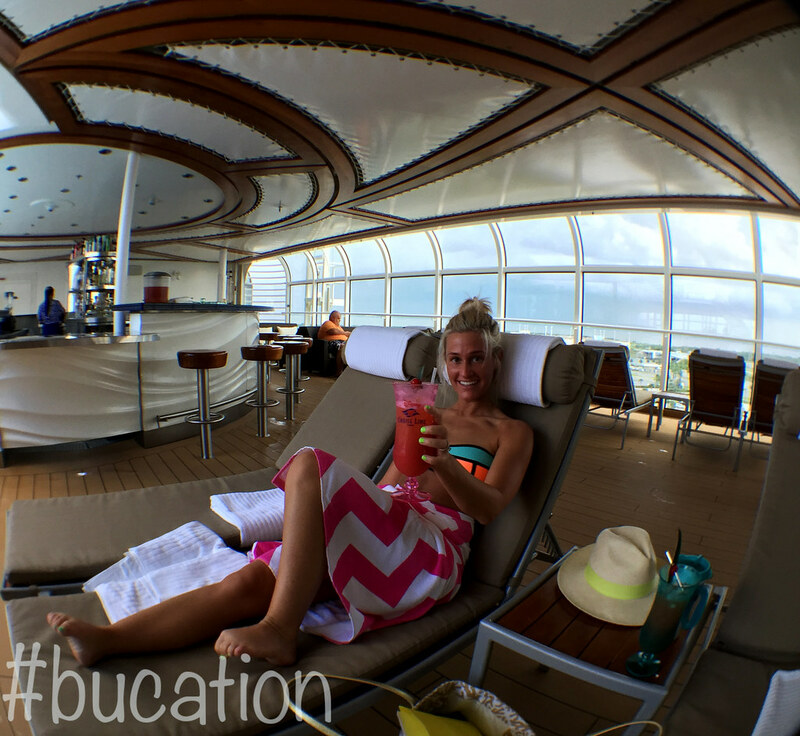 It was an incredibly relaxing afternoon, and it was exactly how we wanted to spend the very first day of our bucation aboard the Disney Dream. 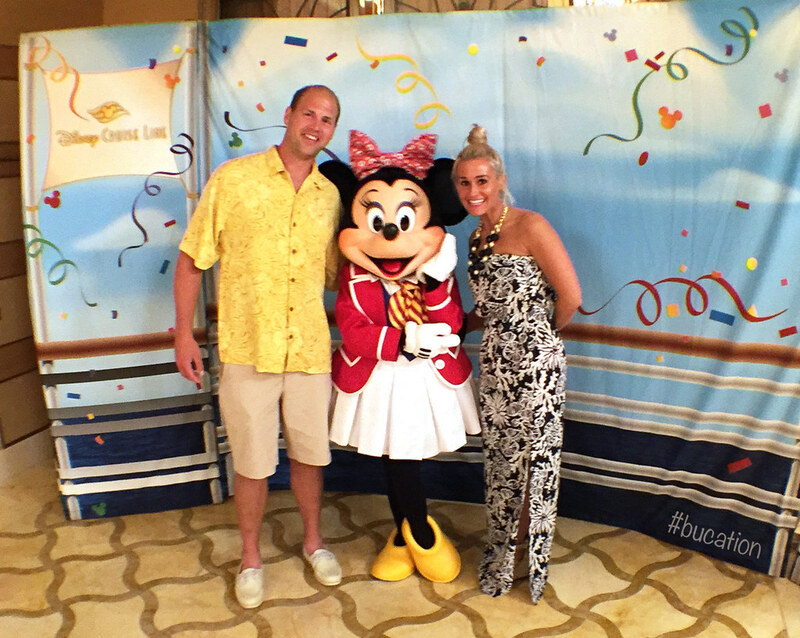 We truly felt like we were on our very own dream cruise and we were certainly living the Disney dream! 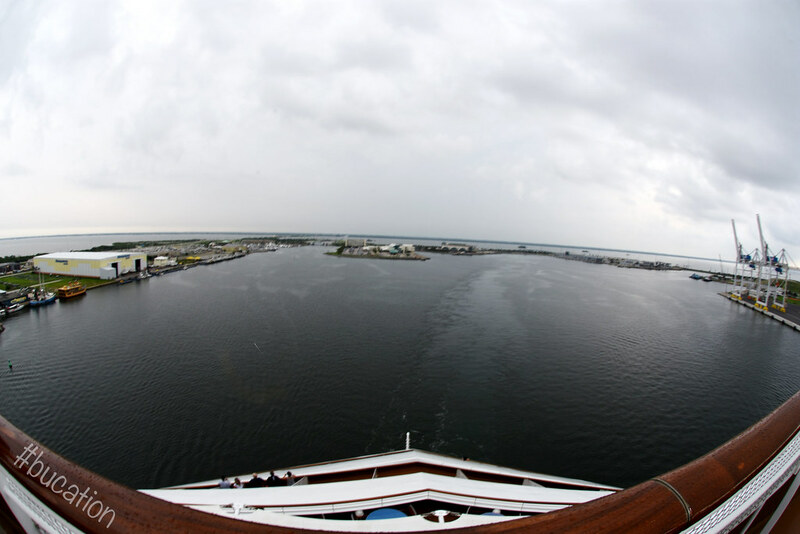 Prior to sail away, a small rainstorm passed through Port Canaveral. We took this opportunity to grab a quick bite to eat at the three quick service stations which were adjacent to The Cove near Donald’s pool. Our quick service at Flo’s V8 Cafe (the Disney Dream’s onboard cafeteria) our options included, Luigi’s Pizza, Tow Mater Grill, and Filmore’s Favorites. We enjoyed one of Tow Mater Grill’s grilled to order Lightning McQueen hamburgers, french fries, and a fresh panini from Fillmore’s Favorites. The cafes were pushing out fresh orders without issue, and there were no long lines for us to compete with. The area surrounding Flo’s V8 Cafe featured a number of window-side tables that offered a full length view of Port Canaveral. However, we enjoyed our lunch in The Cove along with a few more cocktails before we began to explore the ship. 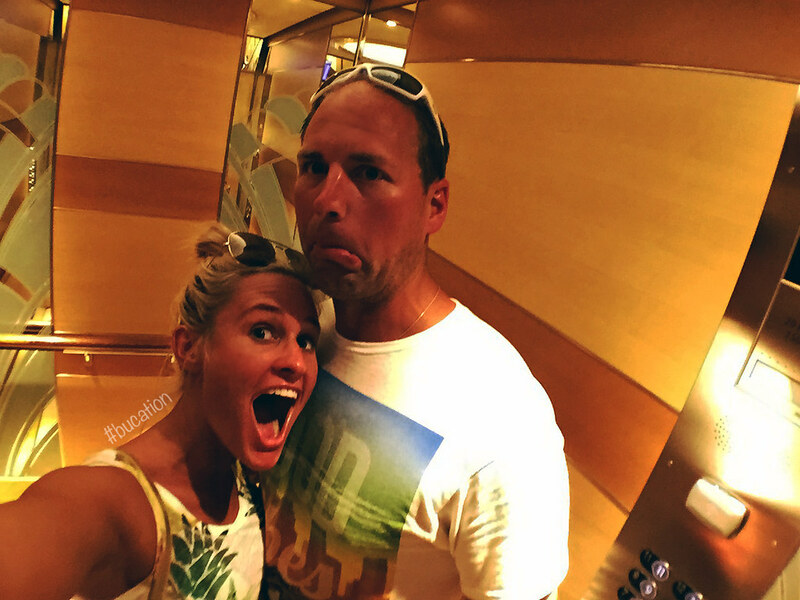 During our exploration of the ship we made a pit stop to see if our stateroom was ready, and to our surprise it was! Our luggage was also waiting for us outside our door. It wasn’t long after we entered our room that we were greeted by our fabulous stateroom host, Wijaya. 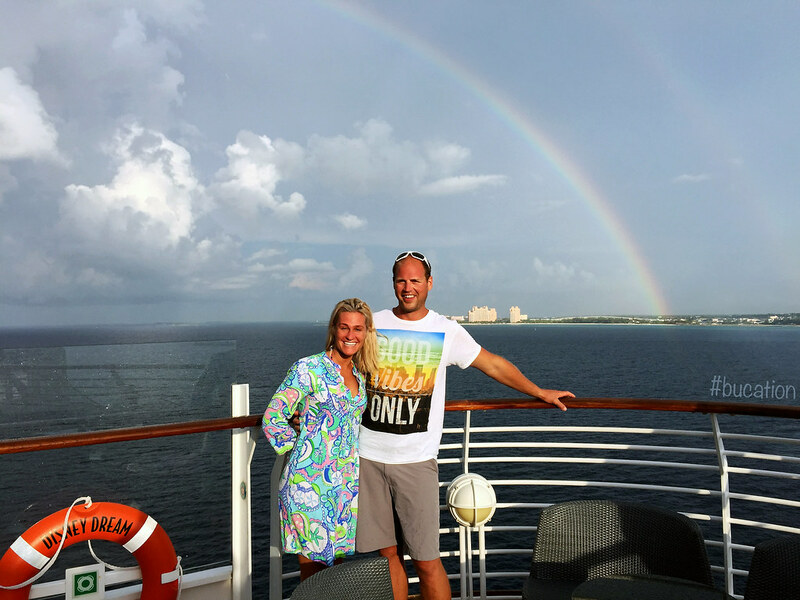 The level of personalized service Wijaya, and the rest of the stateroom hosts, provided us with was truly fantastic. Onboard Disney magic was all around us, and we truly felt a level of customer service that we sadly haven’t felt at the Walt Disney World Resort since the late 1990’s. Our stateroom, 9608 was on the ninth floor truly in the center of the ship. We were conveniently located between the midship and aft staircase. The location of our stateroom was convenient to both the midship elevators, which allowed quick access to The Cove, but our stateroom was also a short walking distance from the ship’s aft staircase which ascended to the entrance of Cabanas, the Disney Dream’s breezy breakfast, lunch and dinner buffet. 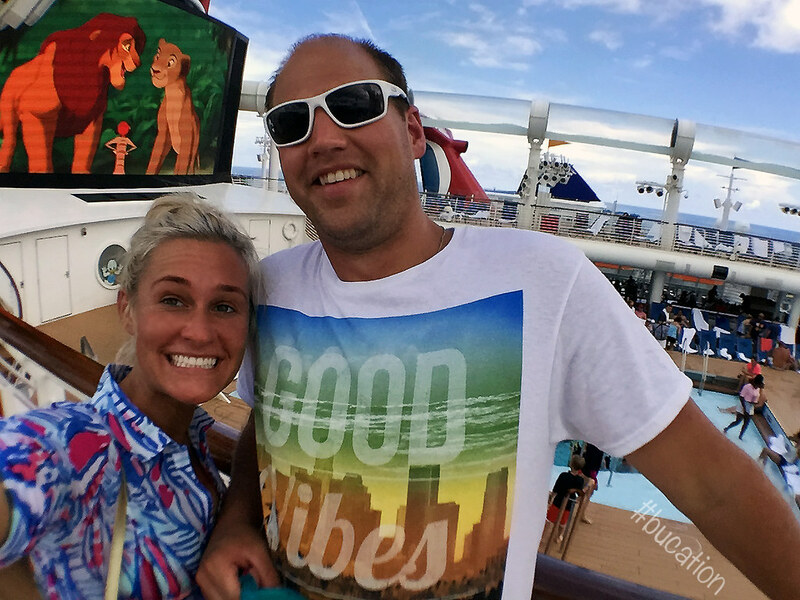 We’ve experienced some close quarters at sea, but our experience with Disney Cruise Line was the exact opposite. 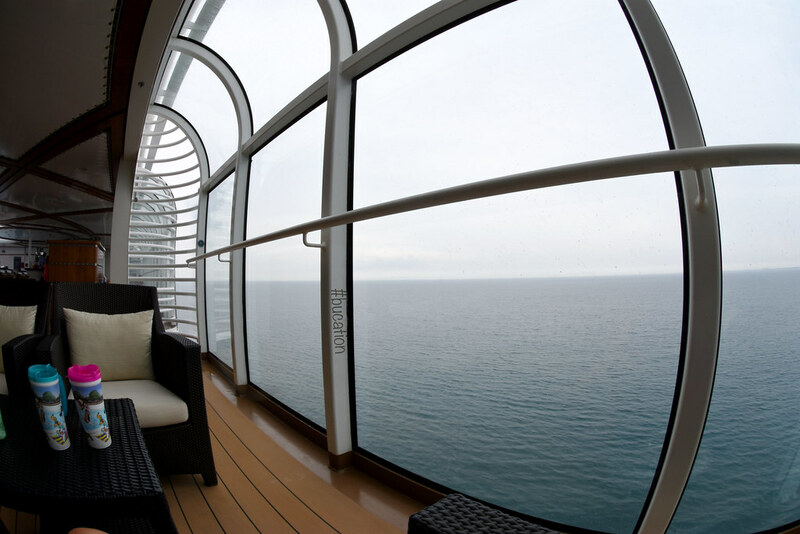 DCL offers a variety of stateroom categories and sizes. DCL’s website details this information during the booking process which makes it easier for guests to select the size and location of the stateroom of their your preference. 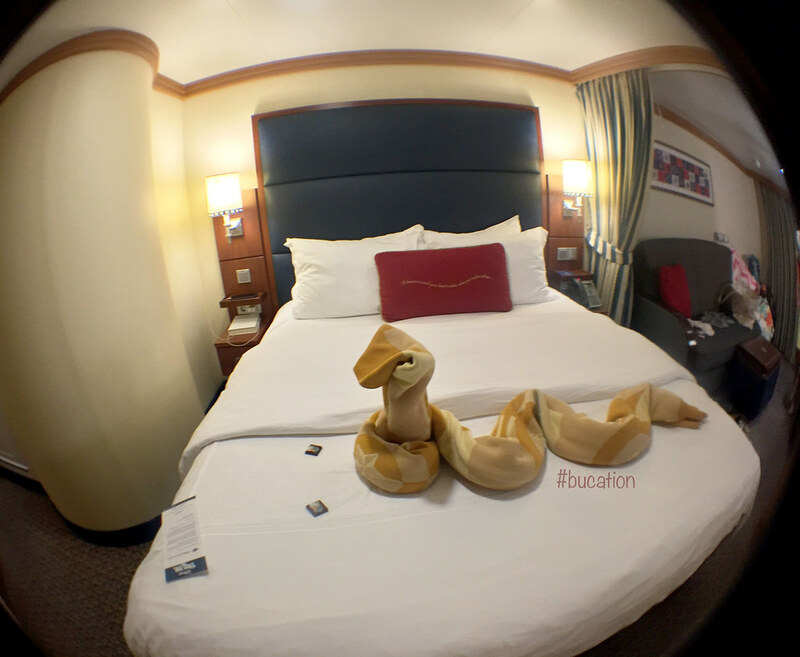 In our experience, Disney Cruise Line offers more square footage when it comes to stateroom size than any of the other cruise lines we’ve sailed. 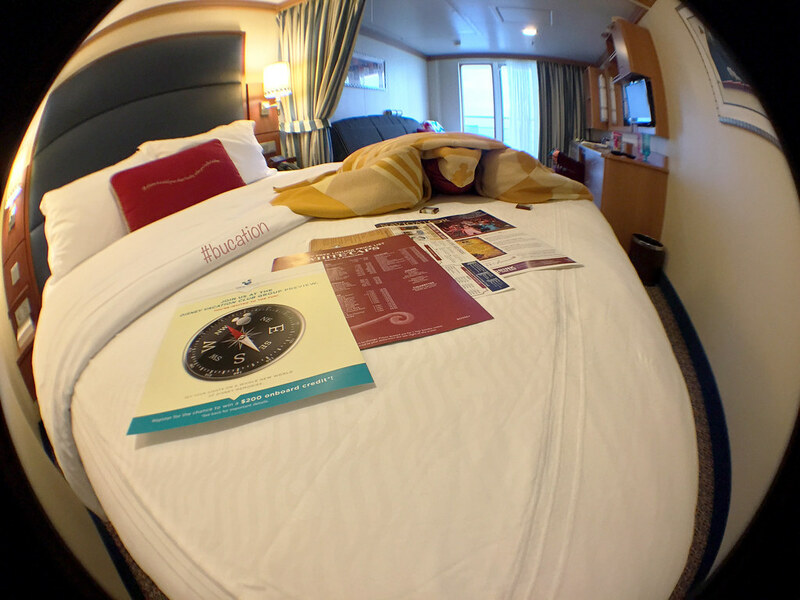 With its spacious accommodations, Stateroom 9608 felt like home. The size and layout of our stateroom was unlike any we’ve ever experienced at sea, and it is worth noting that the walls of our stateroom must have been soundproof. Not once did we hear any activity from our neighboring shipmates. 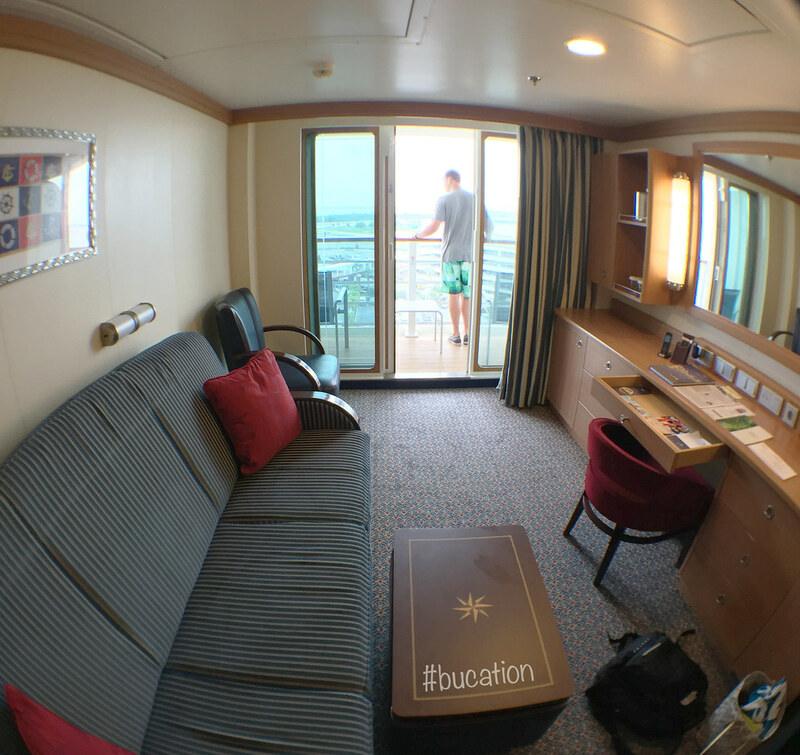 Our stateroom was separated into dressing, sleeping, and living areas. The dressing area consisted of a split bath and a wardrobe which were located in the room’s entryway. The double and single hanging wardrobes were a wonderful option to hang all of our dress clothes, and the built in shelves in the double wardrobe allowed for overflow from the huge dresser in the stateroom’s living room area. The double wardrobe also housed the stateroom’s safe which easily fit our iPads and other electronic devices. The bathroom included a second sink, round tub, and a rain shower with a double seat wall. 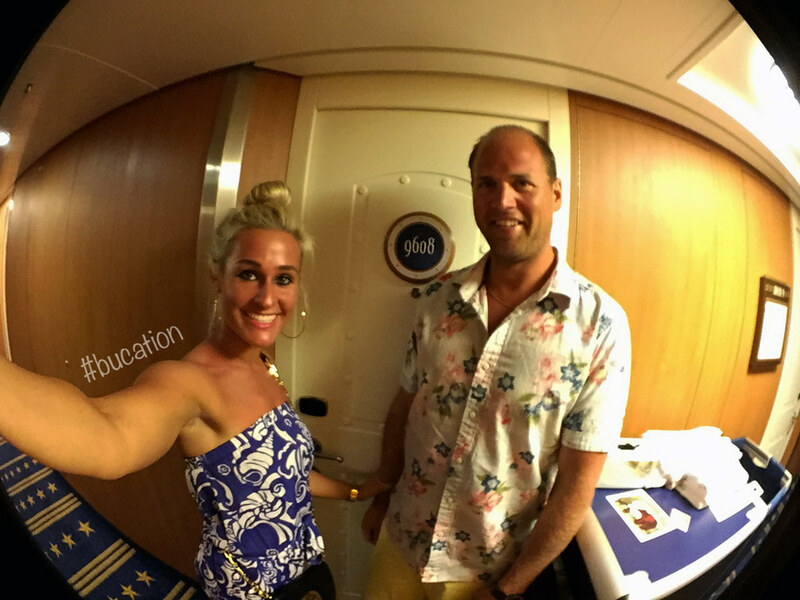 We both agreed that the stateroom’s split bathroom concept, which we’ve only just experienced on Disney Cruise Line, is genius – especially for families or large groups sharing a stateroom. 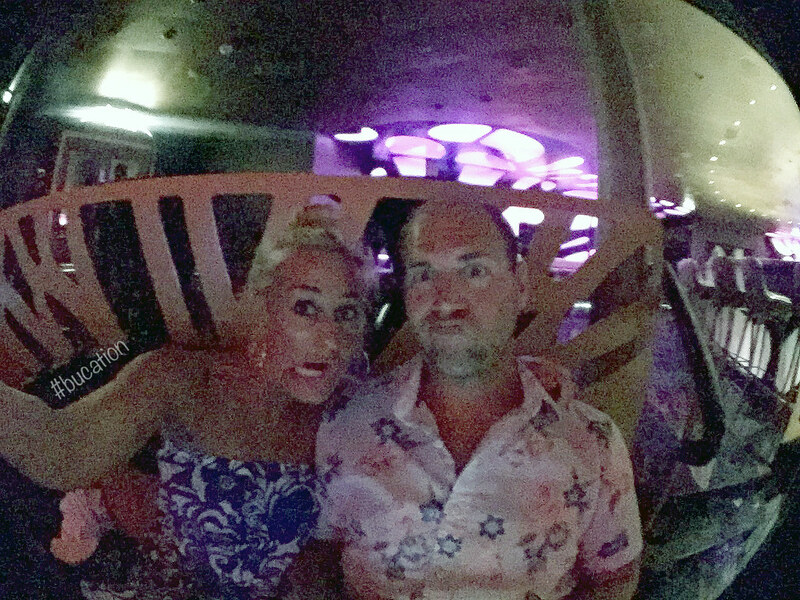 Even the built-in shelves surrounding both mirrors made us feel more like we were at home rather than on a cruise ship. The bedroom featured a comfortable and elevated queen size bed with built in night stands, and the elevated bed allowed for easy under-bed storage of our luggage. A heavy privacy curtain separated the bedroom area from the living room area, and a flat screen television was swivel mounted on the wall. The television could easily be arched for viewing from one room to the next. The living room housed a sofa bed, an arm chair, a full size dresser equipped with a large mirror, mini-fridge, and a writing desk. Electrical outlets were available both bedside as well as in the living room dresser. We reserved a Deluxe Family Oceanview Room with Verandah, Category 4A. 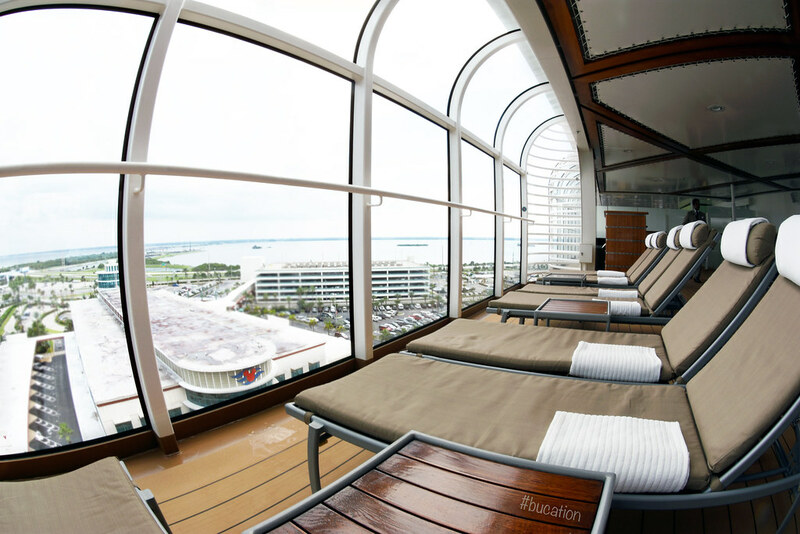 If the price is right, we highly recommend reserving this category stateroom. Our verandah was also a nice retreat during the busier times on the ships upper decks. Our verandah was the perfect way to take in the spectacular views and fresh vitamin sea. The views from our verandah were simply breathtaking both day and night. Since we brought alcohol on board with us, and Disney Cruise Line requires guests to enjoy the alcohol they bring on board in the privacy of their staterooms, it was nice to have somewhere as lovely as our own personal verandah to enjoy a few cocktails before and after dinner each evening. We cannot praise our stateroom host enough for his excellent service and attention to detail. 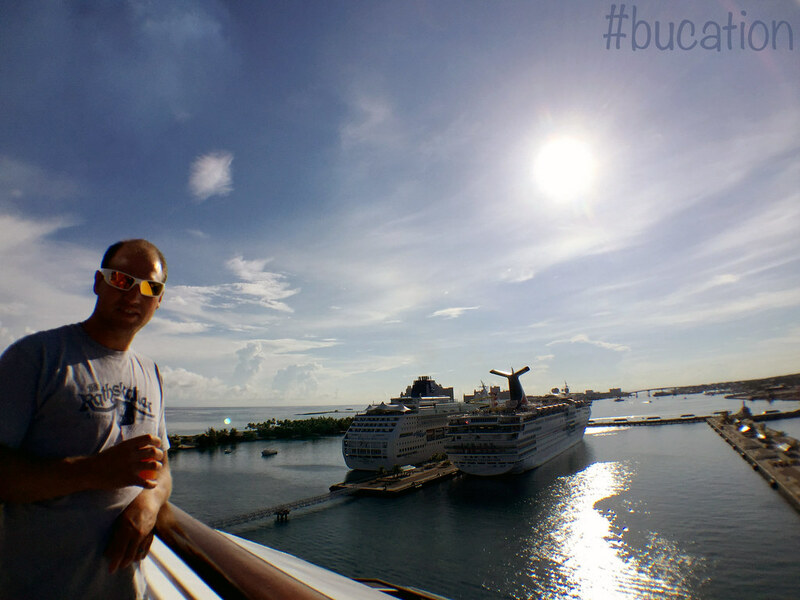 Wijaya went above and beyond during our time on the Disney Dream. Our stateroom was kept in immaculate condition, everything in the room was always in working order, our ice bucket was consistently filled with fresh ice upon arrival each afternoon/evening, and our personal drinkware (souvenir mugs and glasses) were regularly cleaned. We even ran into an issue one evening with our television remote batteries, and Wijaya made sure the issue was resolved within minutes after we alerted him. Wijaya was never far when we returned to our rooms each morning, afternoon, or evening, and he always offered a welcomed greeting each time we’d return. 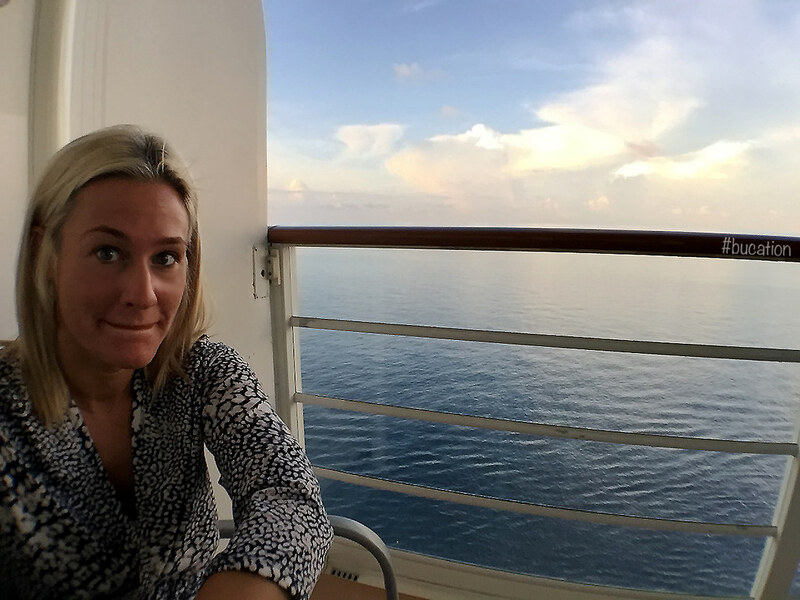 The contagion commonly referred to in this travel myth are the “norovirus.” Yes, we’ve unfortunately suffered from this uncomfortable virus that results in an excruciating bout of gastroenteritis while onboard other cruise lines, and we’ve lived to tell about it. The norovirus is one of the worst things a traveler can experience while away from home or even upon return from a recent trip, and we hope none of you have had or ever contract the norovirus. However, (our background in the bio-decontamination industry is strongly on display here) first and foremost, let it be known that the norovirus does not discriminate. This series of viruses does not exclusively attack cruise ships. From hospitals to nursing homes, school classrooms, college dormitories, and hotels – this virus can be transmitted in a number of conditions via infected water, food, surfaces, or physical contact with a contagious traveler. Secondly, you can rest assured onboard DCL. Disney Cruise Line does an excellent job of keeping its ships in pristine condition. The DCL staff takes cleanliness very very seriously. Staff are constantly reminding cruisers to wash their hands, monitor, and report any symptoms of nausea, vomiting, fever, or diarrhea. One thing we took notice of is that DCL staff greet diners at the entrances to all dining areas with antibacterial wipes perhaps in an attempt to thwart off any outbreaks. We also took note that the buffet stations were manned by cruise ship staff who served each person plate by plate in contrast to the free for all on other lines where guests serve themselves which can risk cross contamination if anyone onboard has unknowingly come down with the virus. 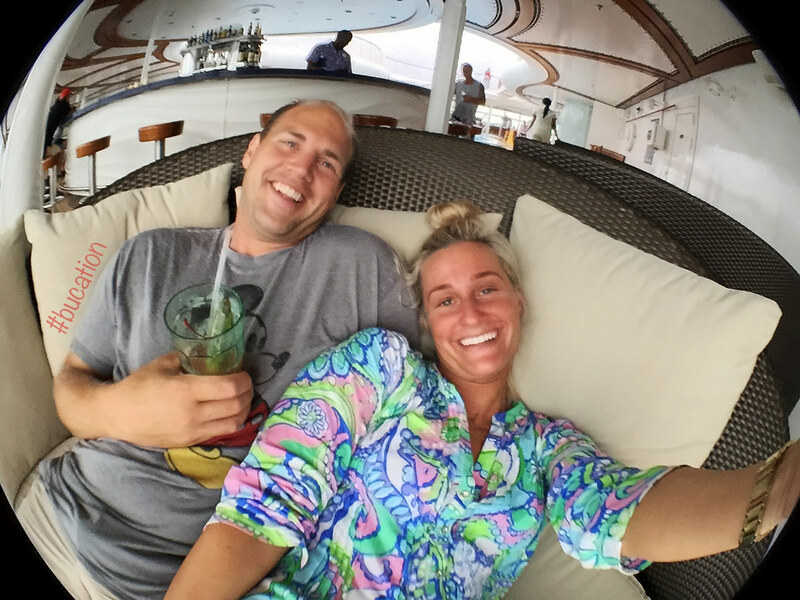 Visiting our stateroom allowed us to pick up our Personal Navigator. Personal Navigators are provided daily by each stateroom host, and they include a detailed description of each day’s activities. Each and every event is listed and allows you to plan your day aboard based on the entertainment, activities, and events included. You may also find the evenings dining rotation details, the drink of the day, and the daily weather forecast also included in the Personal Navigator. Since our itinerary was only a three night cruise, we had the opportunity to dine in each of the three main dining rooms once. We selected the second dinner seating during our reservation process which began at 8:15 p.m. 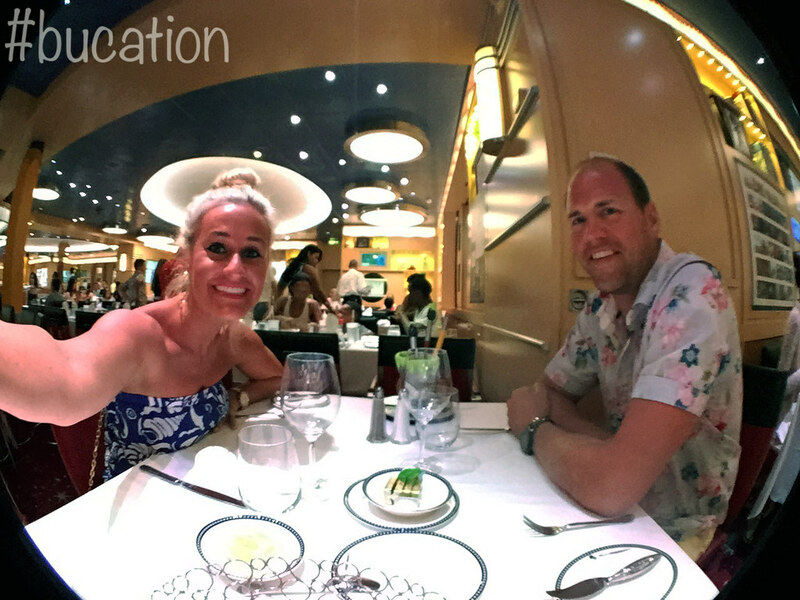 When we are at the Walt Disney World Resort we always prefer late dinner reservations, so we decided to follow suit on our first Disney Cruise Line Experience. We were very happy we selected the second seating because it felt as if it allowed us to fit everything in, and our dining time never infringed on our other planned activities. 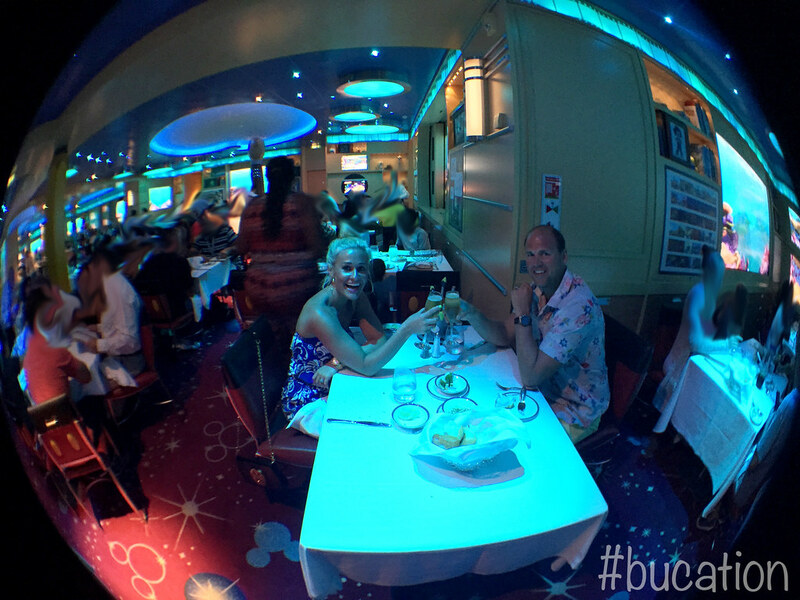 Our dining rotation began with The Enchanted Garden on our first night which is located on deck two, midship. Prior to our cruise, we had reviewed sample menus from past sailings on various travel sites. Needless to say, after reading these reviews, this restaurant was the one we were least looking forward to dining at. We went into the evening with the outlook that at least we were getting the one we felt we’d least enjoy out of the way first. However, we were completely surprised with the menu selection and the cuisine in the Enchanted Garden during our dinner reservation! This was a pleasant surprise. For appetizers, we began our meal with the Ahi Tuna and Avocado Tower and the Lobster Ravioli. Our starters were both delicious, and the ravioli was exactly what we were looking for! The romaine wedge salad was our next course which was very refreshing. This salad was a presentation all in itself! Our caramelized sea scallops and prime rib entrees were bursting with flavor and cooked to perfection. We also couldn’t get enough of the pasta-style side that was featured with the scallops. It was labeled as a quinoa, but it tasted more like a light risotto which is always a good choice! It’s worth noting that we recognize whenever we order prime rib cooked medium rare that it is always a roll of the dice as to whether or not it will be under-cooked, overcooked, or just right. In our experience, this has often been a gamble even at the finest restaurants. The chefs on the Disney Dream were able to cook our prime rib to just the right temperature! Preparing food on such a grand scale is always difficult, and to get each entrée just right was impressive to say the least. Needless to say, we are so glad our dining rotation began with The Enchanted Garden as it won our award for overall best meal onboard. One thing worth noting is that we were completely unaware of the family style dining that takes place on Disney Cruise Lines. 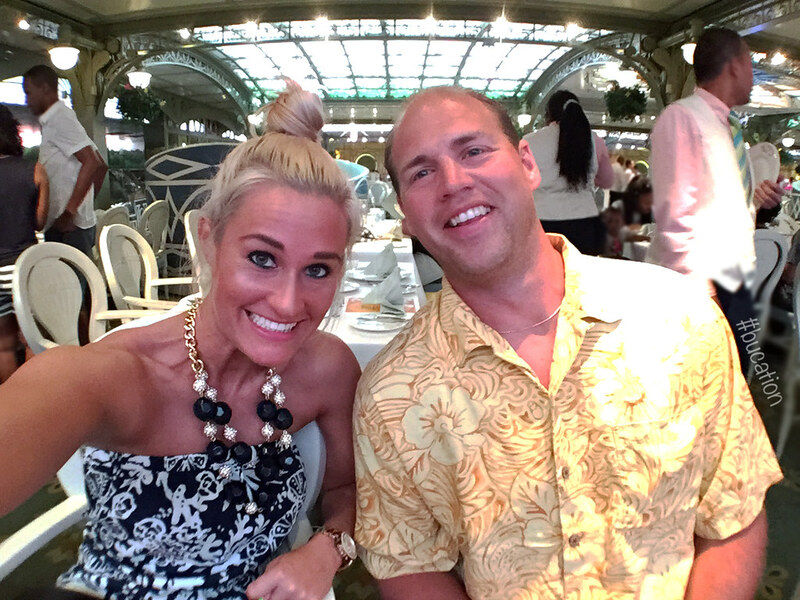 When cruising on other cruise lines, we’ve had the pleasure of both family style and private dining depending on what tables are available upon arrival to the dining room. In all of the research we did, this was a major oversight on our part. In result, we were very surprised when we arrived at our table of six for our first night’s dinner in The Enchanted Garden anticipating a quiet table for two. The dining room was made up of various large, medium, and small group tables as well as tables for two. We continued to look around and wonder how we missed this, and in all of our planning – were we asked our preference on this and in fact somehow we managed to miss this key detail? 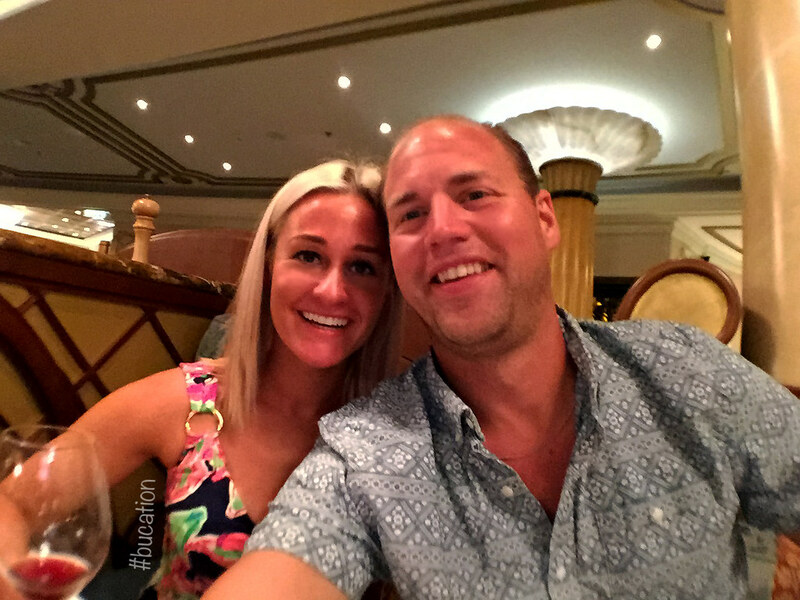 In any ordinary situation, we would treat this as an exciting opportunity to meet new people, learn about their travel likes and dislikes, and hopefully share each other’s experiences on the cruise thus far. We were really looking forward to the possibility of chatting with more experienced cruisers over dinner. Unfortunately this was not the case with our group. Obviously, this is not something to fault Disney Cruise Lines. These table selections are randomly generated, and it just so happened that this particular group wasn’t a good match for us, and fortunately we realized that our dining group was not a good representation of our fellow cruisers. 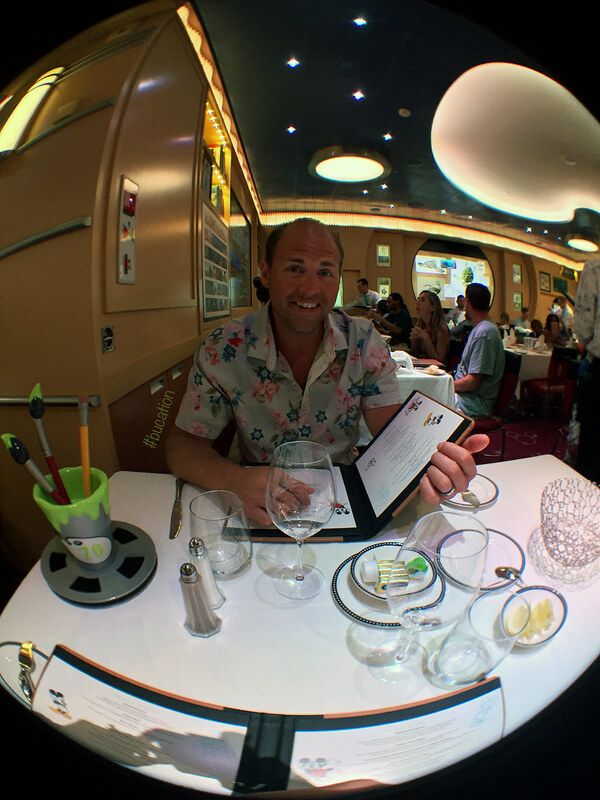 We met so many fantastic and wonderful people throughout our sail on the Disney Dream who we would’ve loved to have spent more time with, especially over dinner. One of the lovely couples we met during our cruise overheard the details of our dining horror story, and they suggested that we visit guest relations to request a private table. 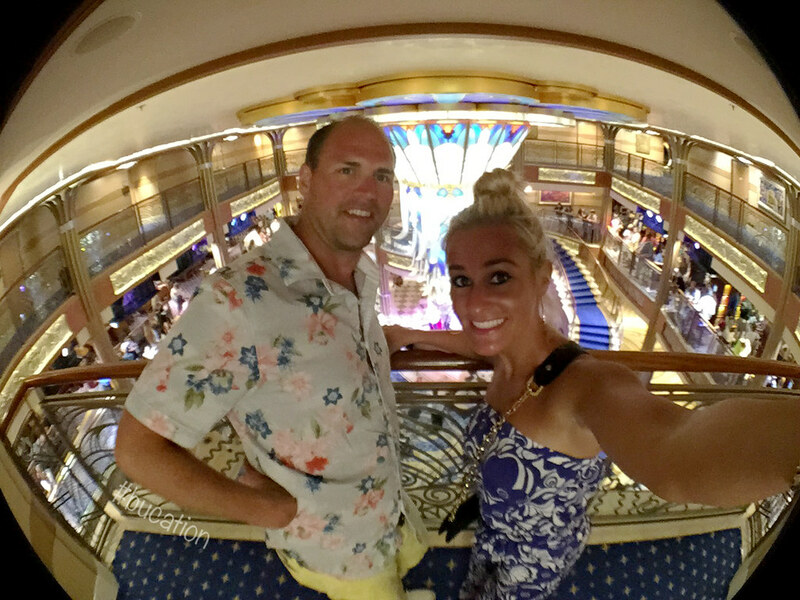 After cruising over twenty-plus Disney Cruises, this couple was a huge resource for us on our maiden Disney Cruise Line voyage. They insisted we not waste another second of our trip as unhappy diners. In result, we met with Emily of the Netherlands at guest relations who was more than happy to make this change for us. Emily insisted this was no trouble at all, and she explained that these type of requests are accommodated regularly. After dinner on our first evening we spent a few hours exploring the Disney Dream’s adults-only after-hours area, The District. On our first night The District never felt over crowded, and there was the perfect amount of fellow cruisers calmly bar hopping throughout the area. Our first port was Nassau, Grand Bahamas. 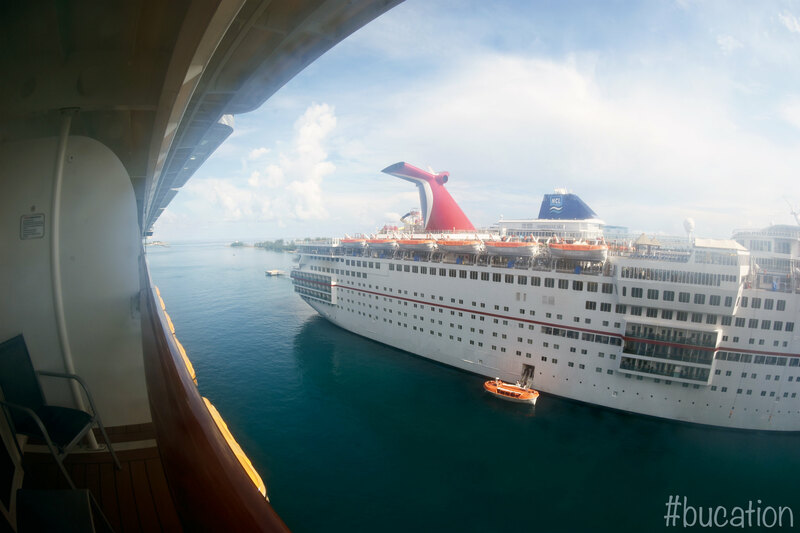 Since this was not our first time in Nassau, we were in no hurry to disembark. 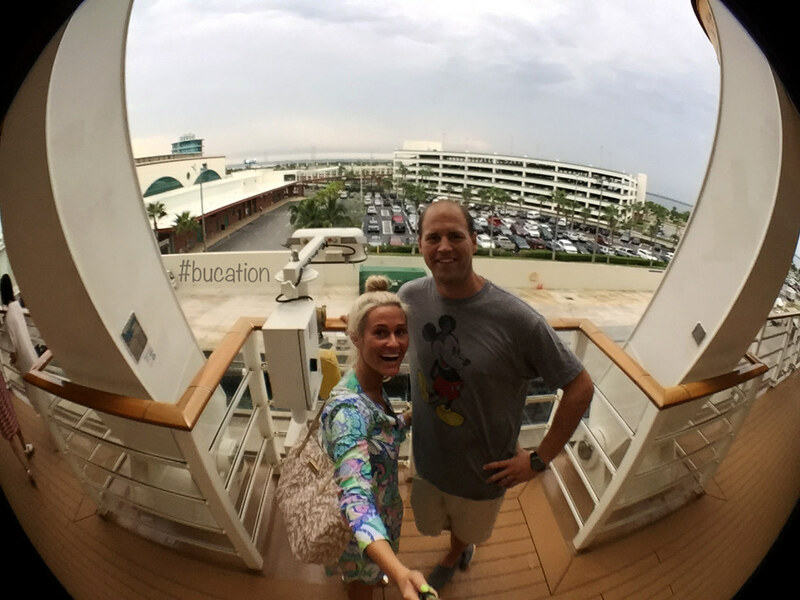 We were early risers and off to enjoy the Disney Dream’s impressive Fitness Center. The Disney Dream’s Senses Fitness area located on deck twelve, forward, offers the same state of the art equipment that you will find in a number of the Walt Disney World Deluxe Resorts as well as Disney’s Coronado Springs Resort. 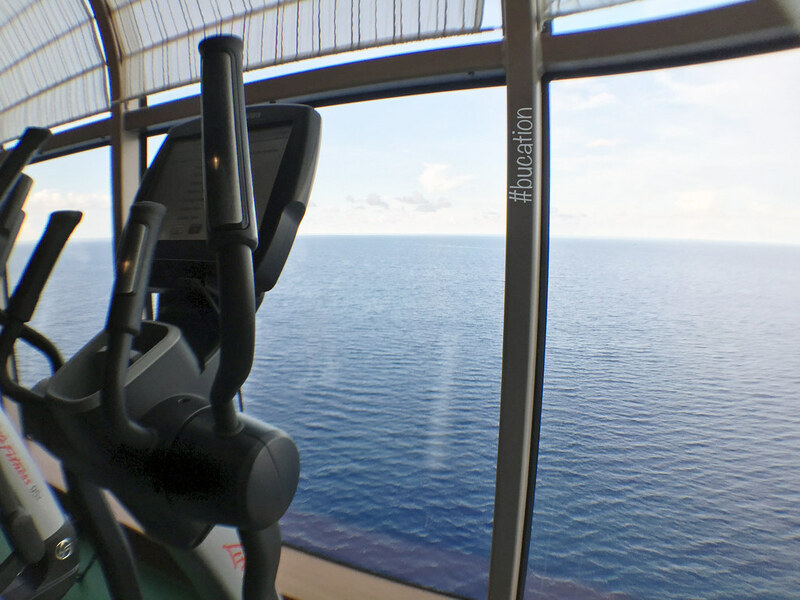 We found ourselves looking forward to our morning workouts and this view. Senses Fitness Area also offers a number of free and a la carte fitness classes with complimentary abdominal and yoga classes offered during each of our morning visits, and these classes are sure to help you show last night’s dinner who’s boss! 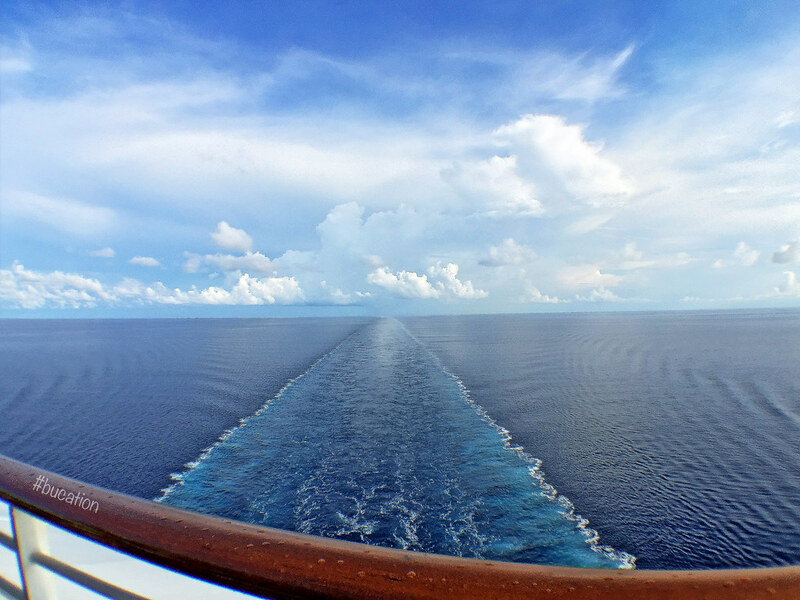 If you haven’t cruised before, you should know that it takes a lot of work on the part of the ships crew to ready the ship so that all its passengers may go ashore on time. Each evening you will be provided with a Personal Navigator for the upcoming day. On our day in Nassau we were cleared to go ashore shortly after 9:30 a.m. as you will see in the bottom left of the Personal Navigator below. The Personal Navigator will detail what time you may head ashore, and most importantly what time you must arrive back at the ship for departure as well as daily activities and tips. As you can see from the Personal Navigators below, there were a number of activities taking place onboard while the Disney Dream was docked in Nassau. From newly released movies in the Buena Vista Theater to character appearances throughout the ship. Before passengers are given the all clear to head ashore, and with so many amenities onboard, we suggest you make the most of your morning on the Disney Dream. Although the quick service stations are available for lunch, Cabanas is the buffet lunch option also available to Disney Cruise Line guests. The decor is Caribbean sprinkled with a few tasteful touches from Disney/Pixar’s Finding Nemo. The restaurant offers floor to ceiling circular views of the sea with both indoor and outdoor seating. We were fortunate enough to enjoy breakfast on the aft patio at Cabanas while the Disney Dream was docking in the Port of Nassau. Since the Disney Dream backs into port in Nassau, this is the perfect vantage point to view all of downtown Nassau as well as a glimpse of Paradise Island while our ship pulled into port. 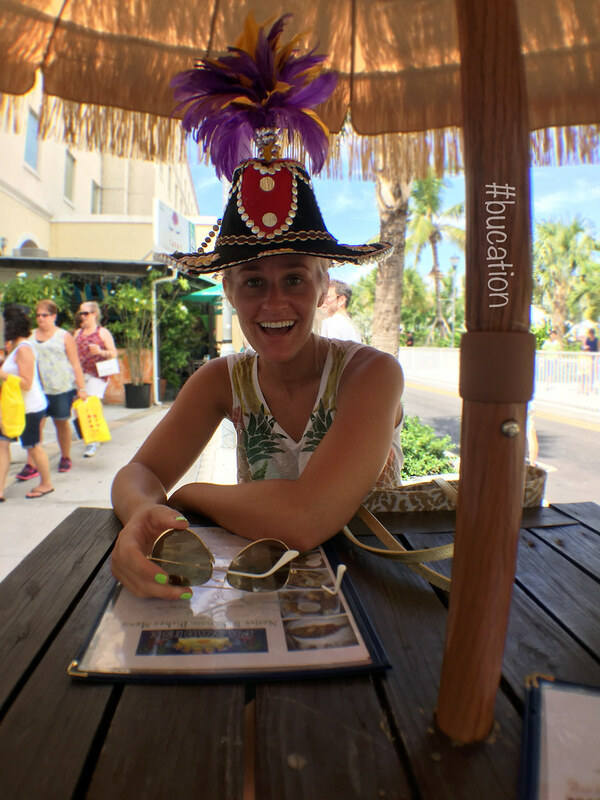 We also used this time to read through that day’s Personal Navigator along with the supplements that detailed shopping and site seeing tips for Nassau. 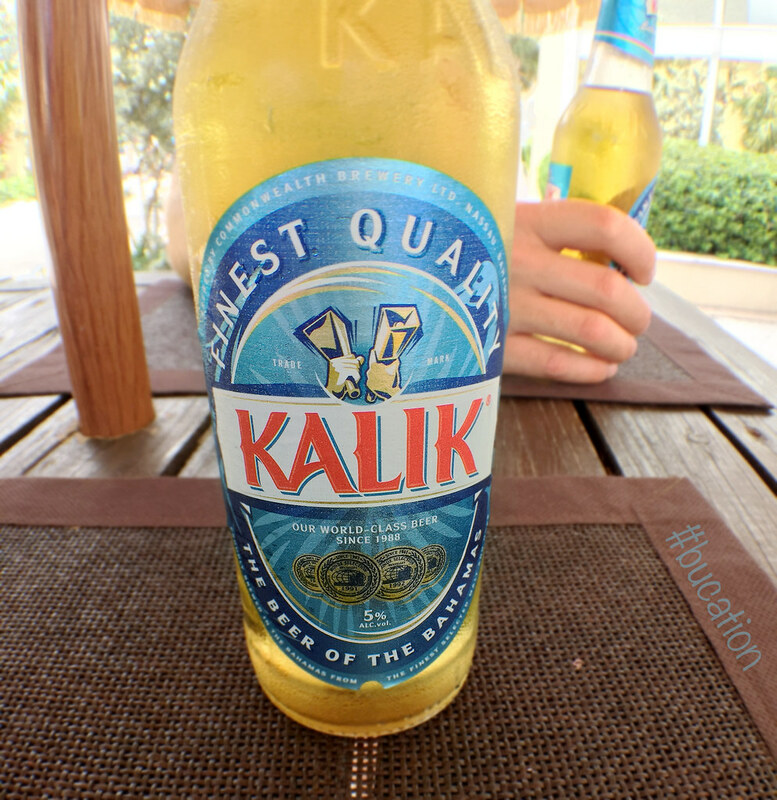 When we did finally decide to go ashore, it was simply to throwback a Kalik (the official beer of the Bahamas) or two before heading back onboard to enjoy all that the Disney Dream has to offer. Nassau was very busy the day we arrived with four other cruise ships in port, and the famous visitors center was closed while it was undergoing major construction. With four other ships in port (five total including the Dream) downtown Nassau was quite crowded. Luckily, we knew our way around which made it easy to get in and get out! We decided to grab a few souvenirs for our family at Del Sol in Price George Plaza on Bay Street. If you haven’t experienced their famous color changing products and apparel, we highly recommend you visit their Nassau location on your upcoming visit. Adult T-shirts run on average around $28.00 (USD), but they also offer an expansive clearance section in the rear of the store where you can easily find more affordable souvenirs that are deeply discounted. After all, where else can you purchase nail lacquer that drastically changes color in the sun? It was mid afternoon and we were back onboard. 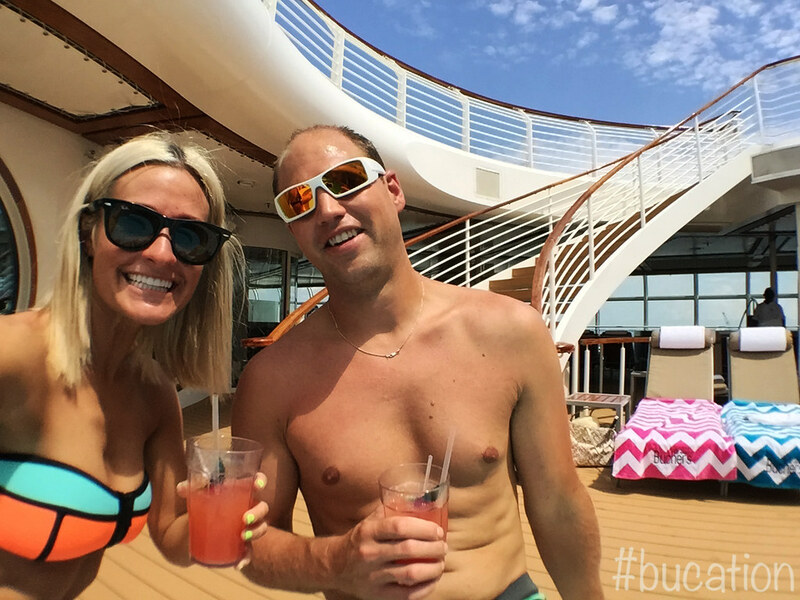 We planted ourselves in the adults-only pool where we relaxed with our fellow cruisers and a few Yellow Birds (the drink of the day). 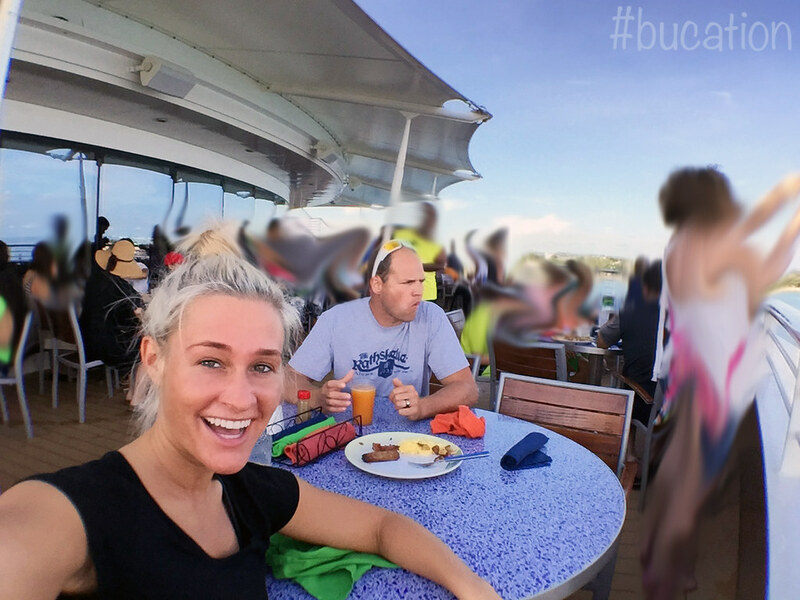 We were surprised to see how many of our fellow cruisers also decided to stay onboard while our ship was in port. The sun was shining, and the pool deck was packed. There wasn’t a cloud in the sky. Everyone wanted to take advantage of the perfect weather conditions. Both the family and adult areas were incredibly busy which made it difficult to find a lounge chair. The areas we had all to ourselves the day before had suddenly become very popular on this gorgeous day in Nassau. 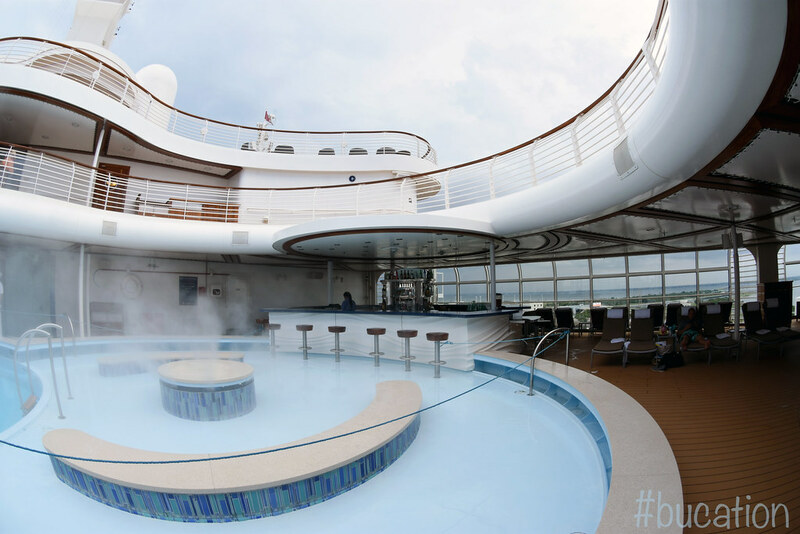 We can remember having other cruise ships all to ourselves on port days, but obviously Disney Cruise Lines does a great job of keeping their guests onboard with exclusive activities and amenities. With no chairs in site, we took the opportunity to ride the Aquaduck a few times. Afterwards, we found a few lounge chairs adjacent to Donald’s family pool, and we caught a showing of The Lion King at the main pool – Hakuna Matata. As we left Nassau, we camped out at Currents open-air bar for sail away. 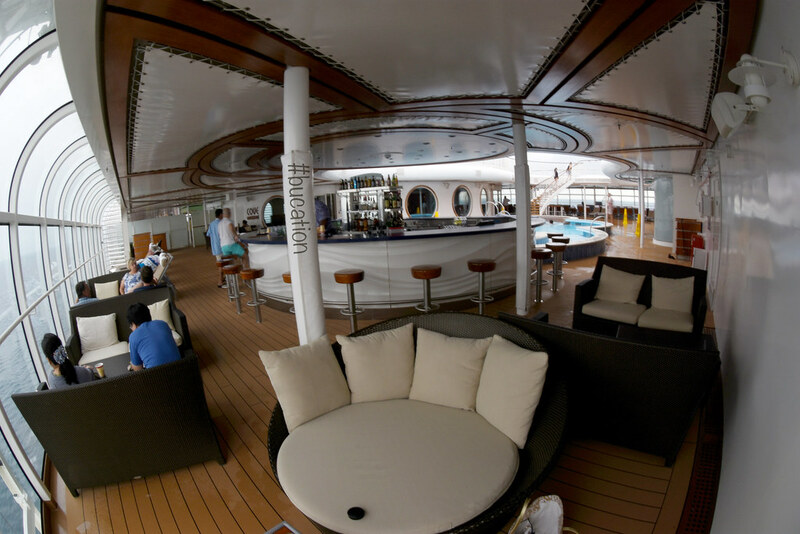 This adults-only bar and its attached lounge offers the best views, aside from the aqua duct, throughout the ship. A small shower moved through the area while we awaited sail away, but the sun continued to shine. We spent sail away with a fantastic group of our fellow cruisers at the bar area. Currents Bar is located on Deck 13, forward, and it is a great vantage point of not only the Disney Dream but also of the surrounding areas. 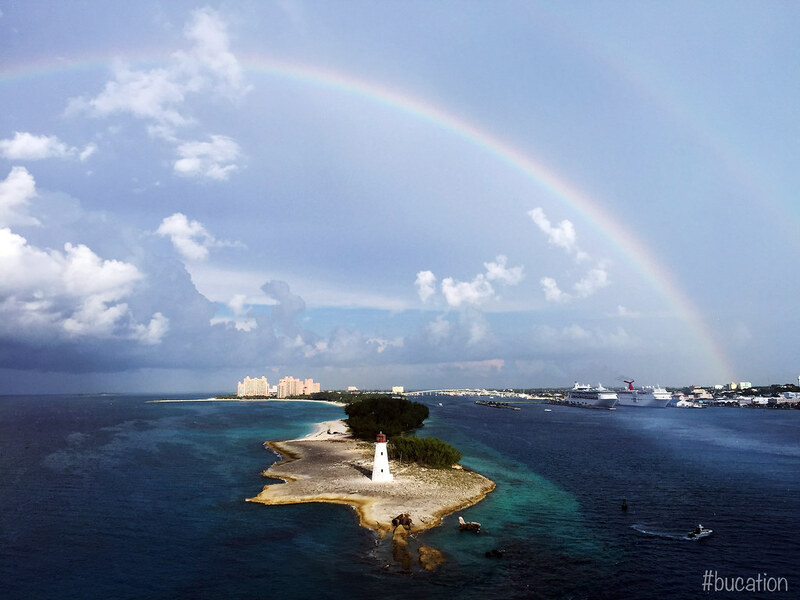 A beautiful rainbow formed over the Port of Nassau and luxurious yachts were cruising by while we were pulling out of Nassau Harbour, and it was a great opportunity for us to snap a few pictures. We dined in the Royal Palace for dinner on our second evening. 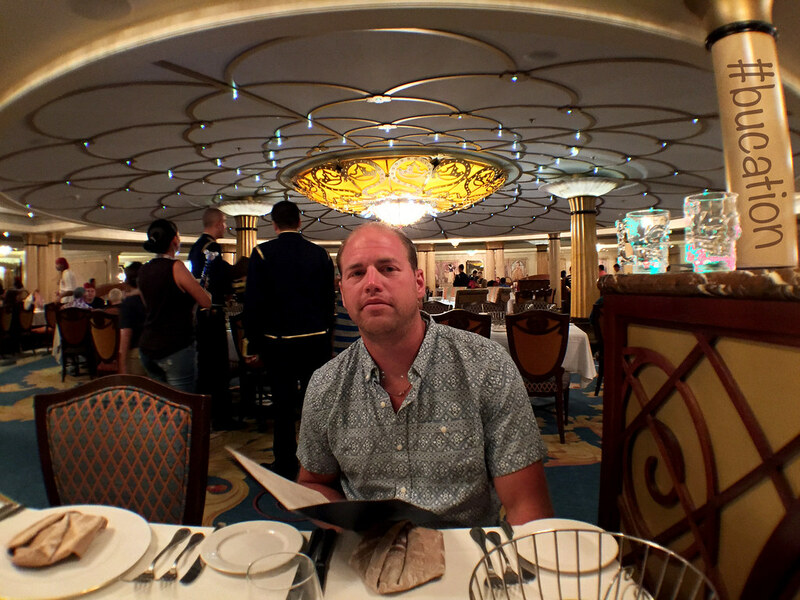 From the moment we booked our cruise, this was the dining experience we were most looking forward to. After reading a number of online reviews and speaking to friends and family, the Royal Palace seemed to be at the top of everyone’s must-dine list. The Royal Palace’s decor was fit for modern royalty. Modest references to classic Disney princesses could be found throughout the venue, including the arrival of our dinner rolls in a basket that could’ve easily been mistaken for Cinderella’s famous coach. For our regal dining experience we had our very own private table for two. We truly had a wonderful and intimate dinner thanks to our head server, who was also our Dining Rotation Manager, Ronald who made us feel like french nobility. The restaurant offers French-inspired continental cuisine. For our appetizers we selected the Duck Confit, the French Onion Soup, and the Escargot. Each were delicious in their own right and if there was no more to come, we would have loved another round of the Escargot! For our entrees we chose the Chateaubriand-Roasted Filet Steak and the Roasted Rack of Lamb. Both entrees were delicious. The Filet was melt in your mouth good, and again it was cooked to a perfect medium rare temperature. The Rack of Lamb was so good, we certainly could’ve eaten another! Ronald and our service team did an excellent job of making sure we had enough of everything, and our glasses were never empty. Overall our dinner in the Royal Court was fantastic. 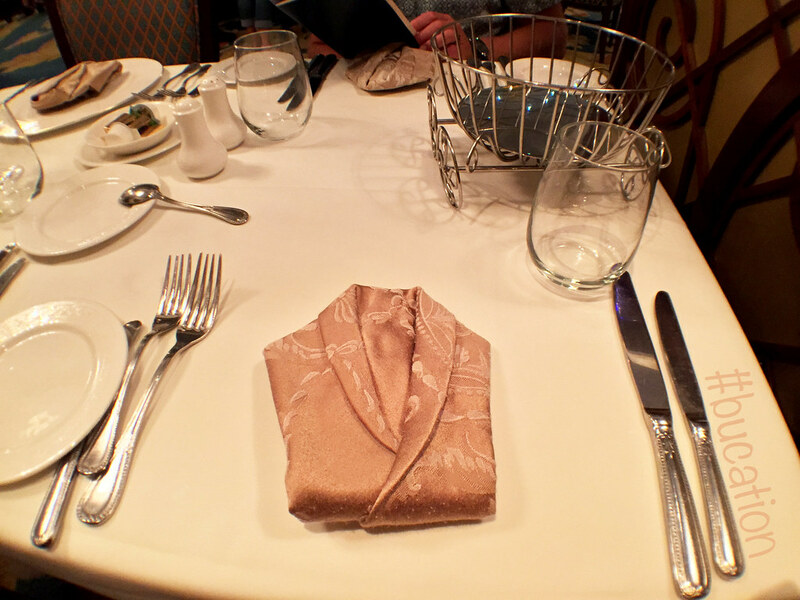 Disney Cruise Line’s dinner service, at least in our experience, does not include any major productions or fanfare during your dinner seating. If you plan to dine at the Royal Palace to see Disney princesses, you will be highly disappointed. Unlike Cinderella’s Royal Table in the Magic Kingdom, there were no characters, and there was no song and dance during dinner service at any of our meals. For us, this was a nice change. Other cruise lines have performed over the top dance numbers and even required audience participation throughout our dinners which can make it difficult to carry conversations or even enjoy special moments. Leave the hootenanny to the Hoop-Dee-Doo, and enjoy the true dining experience that each venue brings on the Disney Dream. However, it should be noted that Pirate Night brings out the cosplay. Pirate Mickey themed bandannas are provided in each stateroom prior to dinner service for those who are in the mood to party like a pirate. From the moment we arrived back onboard in Nassau, there were a number of passengers in costumes more elaborate than the actual characters you often see in Walt Disney World. There were a number of Jack Sparrow impersonators having their way with guests who were happy to play along. We were impressed with how dedicated they were to their characters. One guest’s Davey Jones costume and impersonation was so on point that lines began to form for photo ops around him! Fear not, if you are not interested in donning an eye patch and bandanna like the others will not be alone. 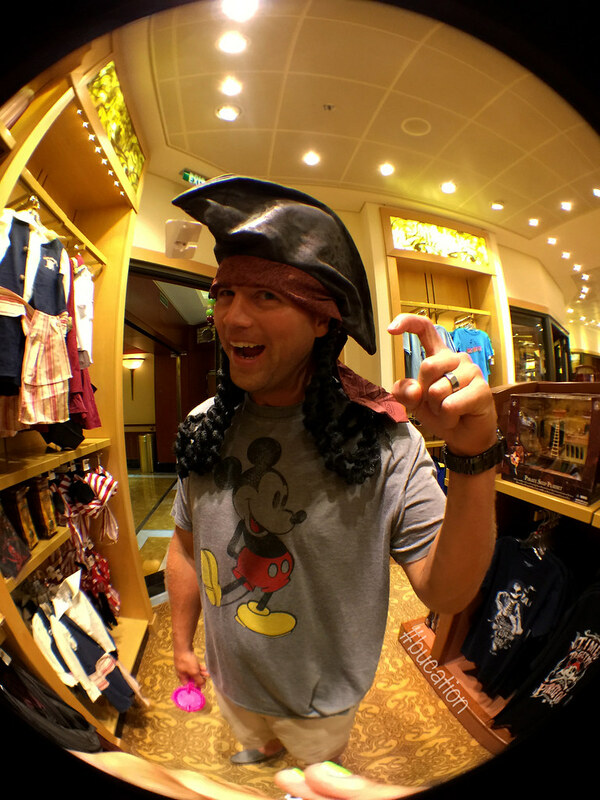 Although the majority of guests with small children participate in this chance to become a member of the Pirates of the Caribbean, we were not alone in our cruise attire, and we were still able to enjoy the pirate festivities held that evening. A Pirate’s Life For Us! After dinner in the Royal Court it was off to the main pool deck for Pirate Night. We grabbed some Eye Scream (a self-serve ice cream station) and headed over to the a covered Donald’s pool deck for the show. When we arrived on the pool deck we noticed a number of other ships in the waters nearby. This was the first time we were able to view other ships so close. The main pool was covered for the event and the pool chair were removed. The Aquaduck is also closed during this time. There were a few seating areas along both sides of the pool deck, but by the time we arrived there weren’t any seats left. We found a nice spot to sit right in the middle of the pool deck itself. We were really looking forward to the Buccaneer Blast Fireworks at Sea show which takes place during the Pirate Night festivities, and they did not disappoint! We weren’t expecting such a fantastic fireworks display at sea which was perfectly themed to the music of the Pirates of the Caribbean, but being Disney we should’ve known better. The fireworks were a brilliant end to our second evening on the Disney Dream. The fireworks were fired off the starboard side of the Disney Dream, which was the same side as our verandah was located. Disney Cruise Lines does not permit its guests to view the fireworks from their starboard side verandah. We received notice in our stateroom regarding the show and instructing us to remove our personal items from the verandah. The Buccaneer Blast Fireworks at Sea show is the perfect example of how Disney Cruise Line pulls out all of the stops with its daily entertainment. 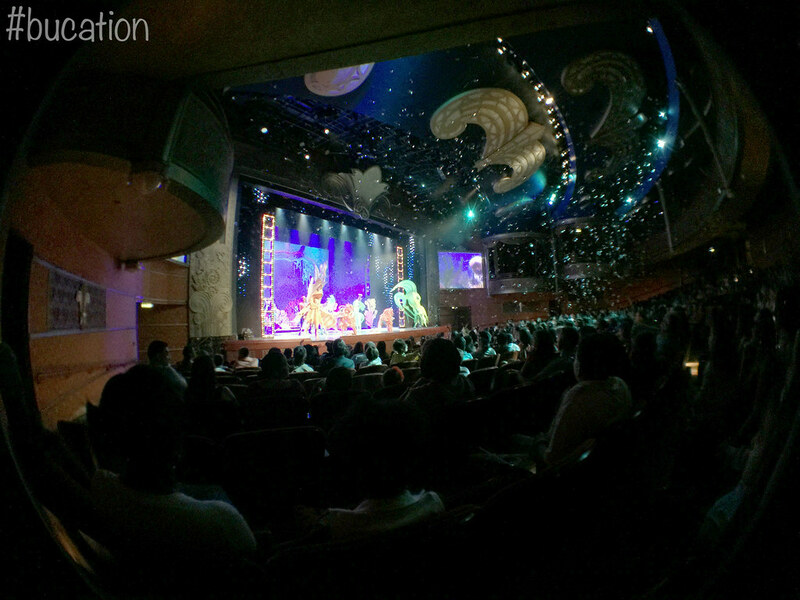 From deck parties to Broadway style shows that rival those in its parks, DCL certainly knows how to put on a show. Even the talented hosts of nightly acts in adults-only areas like The District were on par with some of the best comedians and hosts we’ve seen in years. A number of members of The District staff brought us back to our Disney Entertainment Roots at Pleasure Island reminiscent of old favorites like The Adventurers Club and Comedy Warehouse. The highlight of our onboard entertainment was the absolutely Fireworks at Sea. For us, DCL literally blew everyone of its competitors out of the water with this show! The next morning we arrived at Castaway Cay. 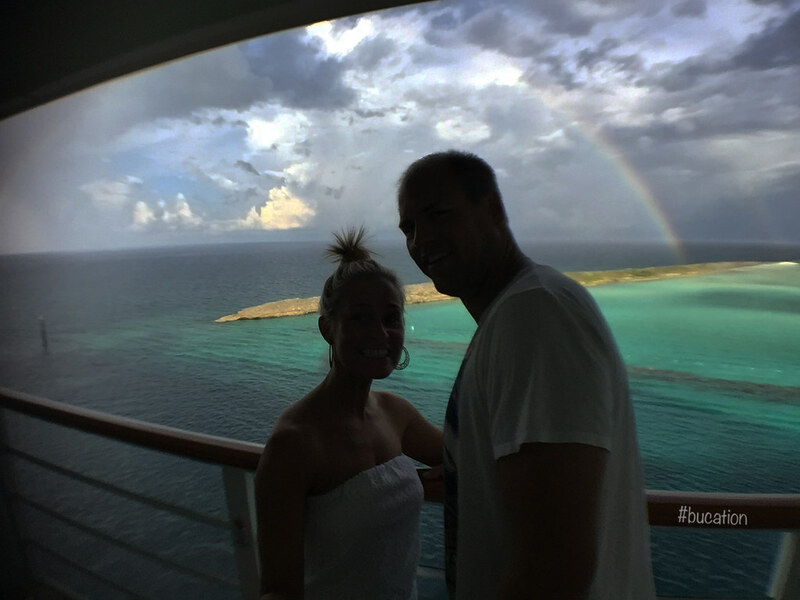 As the Disney Dream backed into it’s private dock at Castaway Cay the weather was overcast with showers, but shortly after we docked the clouds began to part and another beautiful rainbow formed outside of our stateroom verandah. 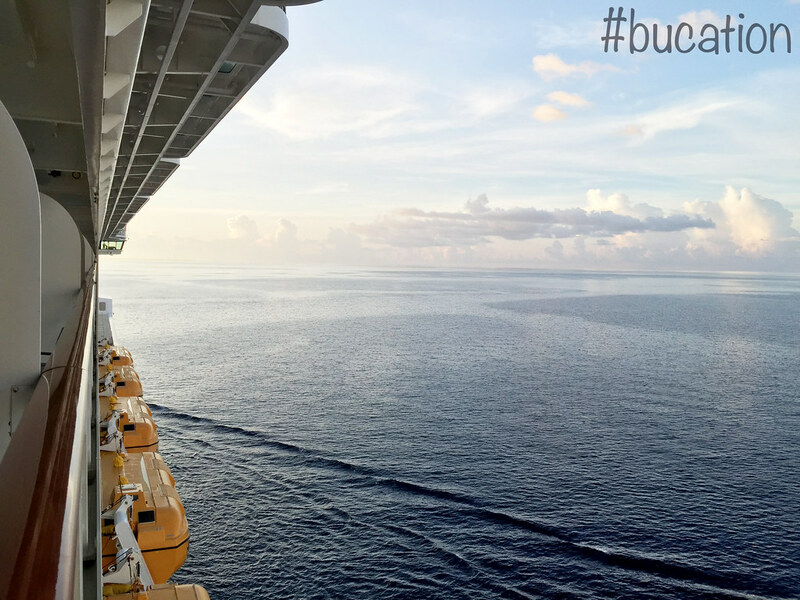 We couldn’t have imagined a better way to begin our morning in Castaway Cay. 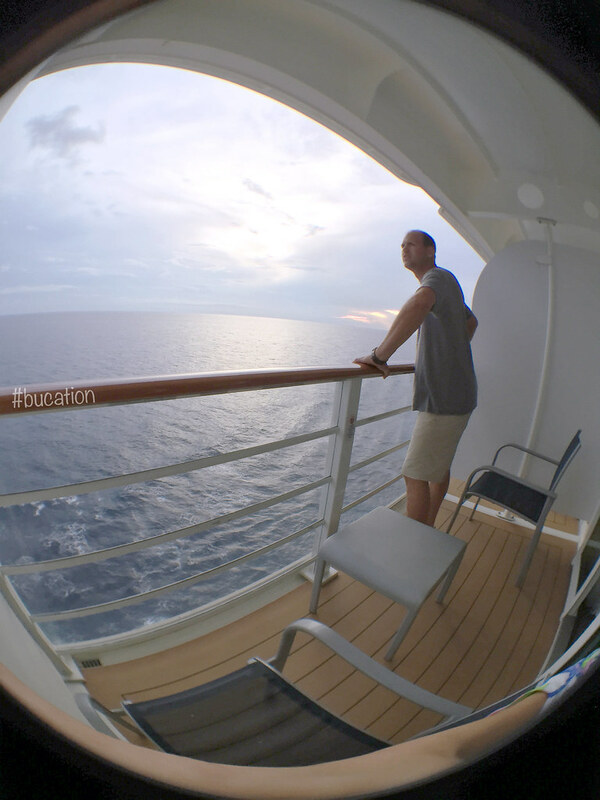 As the Disney Dream backed into the port at Castaway Cay it offered our stateroom an incredible view of the island. 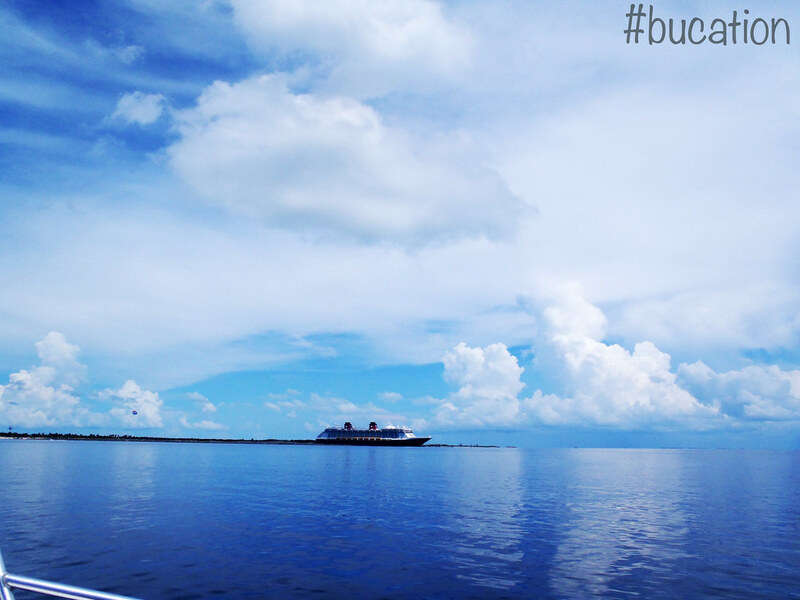 We were amazed at the overall size of Castaway Cay, and the view from our stateroom really put this into perspective. We had done a lot of research prior to cruising with Disney Cruise lines; however, nothing prepared us for how large the island itself was. 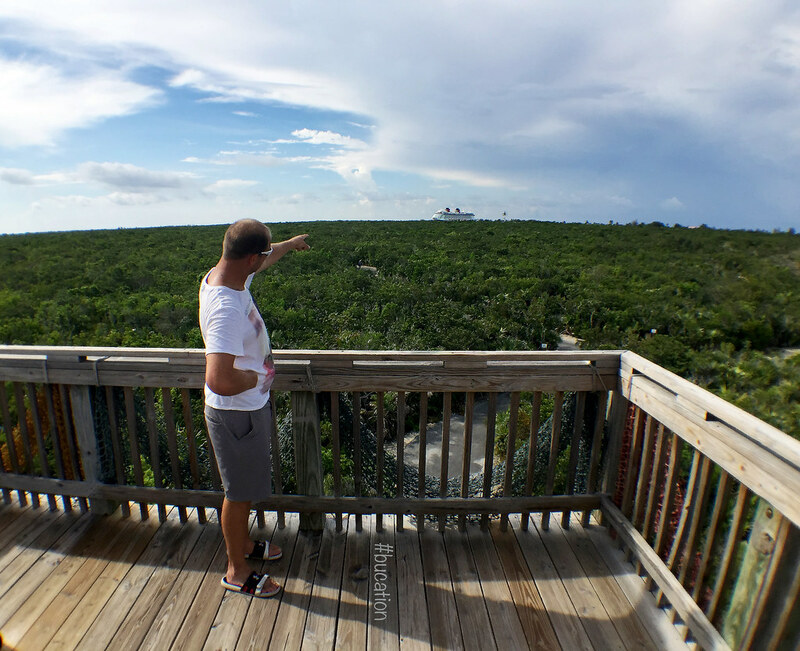 From this point, as well as a few other points on the island itself, you can see that the majority of Castaway Cay is still very underdeveloped. At one point while we were enjoying our early morning on the verandah, the folks who operate the water sports, who reside at a key about 25 miles north of Castaway Cay, began to arrive. We disembarked early for Castaway Cay along with a group of our fellow cruisers who were participating in the Castaway Cay 5k. Again, many of our fellow cruisers seemed to stay on board, however this could have been due to the weather conditions. It should be noted that we are early risers since we have two American Labrador Retrievers back home who have conditioned us to never sleep in past sunrise. We saw this as a perfect opportunity to explore Castaway Cay before the temperatures became oppressive. We walked the winding path from the port through a number of gift shops and food service locations to the bike rental kiosk near the Pelican Point tram stop. There is also a complimentary open-air tram available (very similar to those used in Disney Parks) near the port. The tram transports guests throughout the main areas of Castaway Cay. The trams seemed to operate regularly, and they never seemed overly crowded. 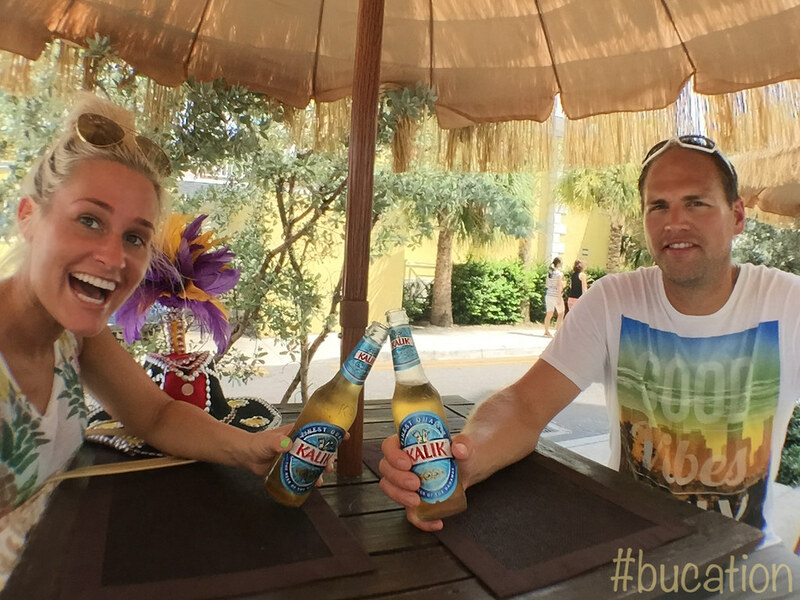 We decided to rent two bicycles, and we explored all that Castaway Cay had to offer. We felt this was the absolute best way to see the island, and we also got to work off a little of last night’s Eye Scream. There are two bike rental locations on Castaway Cay. 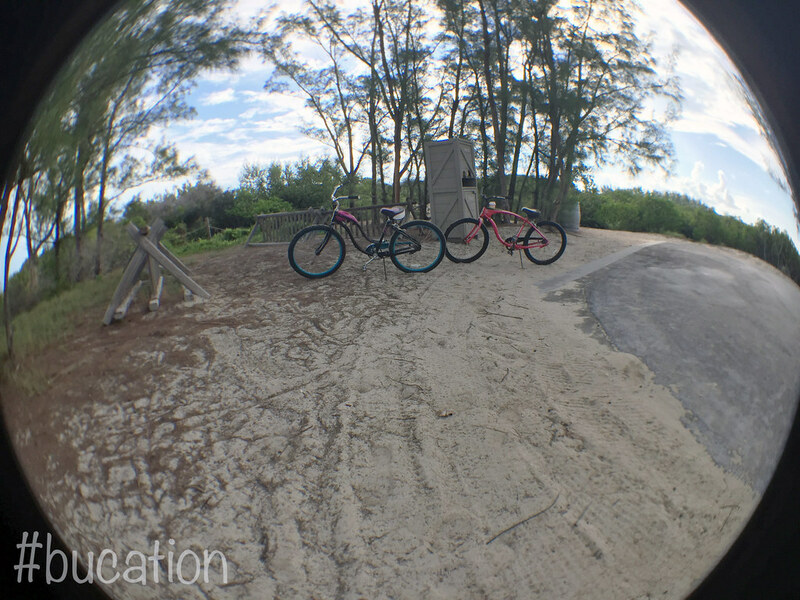 One bike rental kiosk is located in the main part of the island near the family beach, and the other is located near Serenity Bay which is the adults only beach. If you rent at the main bike rental, which is where we rented and head towards the adult beach, you will ride through a small traffic circle which exits onto Castaway Cay’s very own private airstrip which is no longer in use. The airstrip is shared between bicycles, walkers, runners, and the tram service. The airstrip has an early cut off that weaves through a scenic path towards an observation tower. This vantage point is a great spot to take in all the beauty this private Bahamian island has to offer. There are also a number of other scenic view points along the way which are worth checking out. 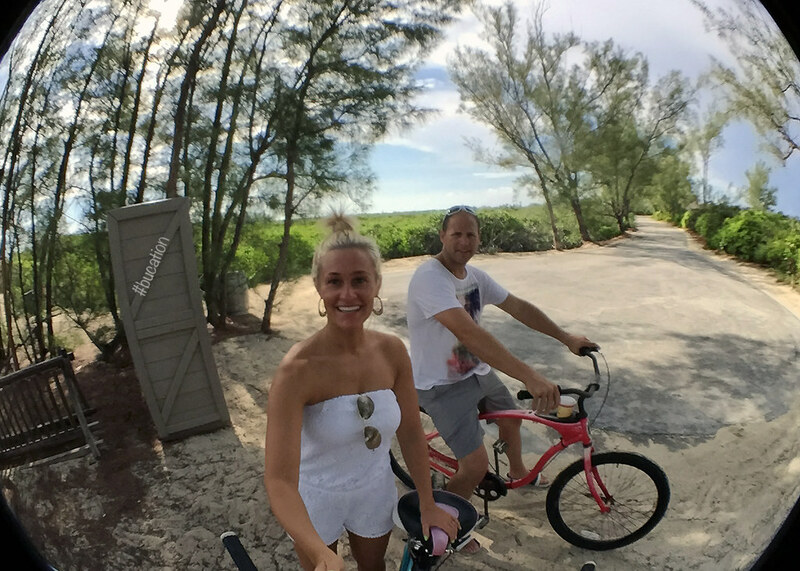 If you have the opportunity, we highly recommend renting bicycles and exploring the island. This was the first thing we did when we arrived in Castaway Cay. Even though the Castaway Cay 5K was taking place at the same time, we felt like we had the island practically to ourselves aside from the runners! The race was contained to the bike path loop with the lookout tower, so we were able to spend time exploring the rest of the island during the race. We brought our own beach bags full of goodies along to the island. During our bike ride, we left our bags in an unlocked bag drop at the bike rental. 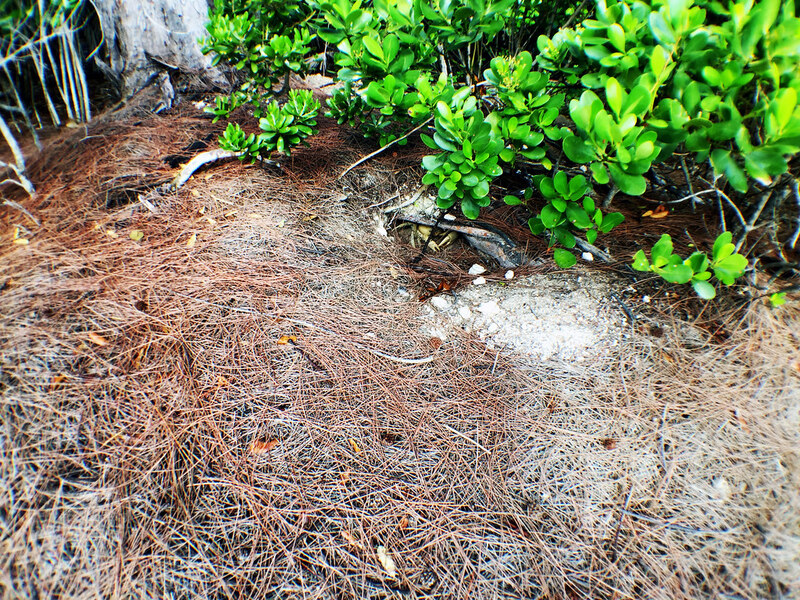 This was the same bag drop that the Castaway Cay 5k runners used for the race. It is not a locker, and it works on the honor system. 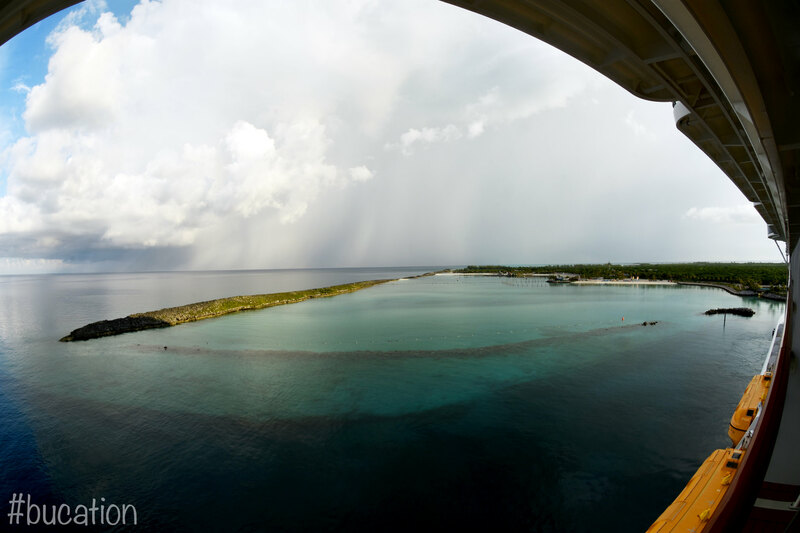 After a few hours of island exploration, the sun began to shine on Castaway Cay. 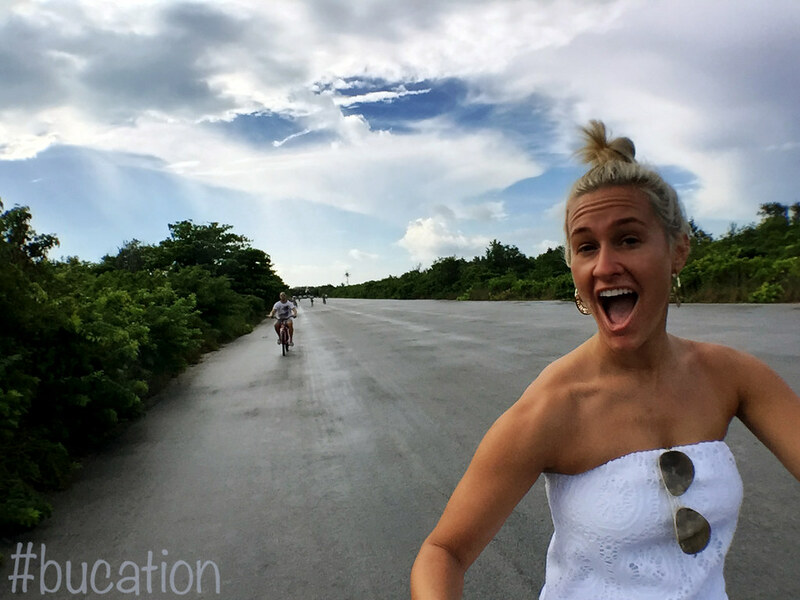 We decided to head back to the bike rental, grab our bags, and take a leisurely walk down the airstrip to Serenity Bay. 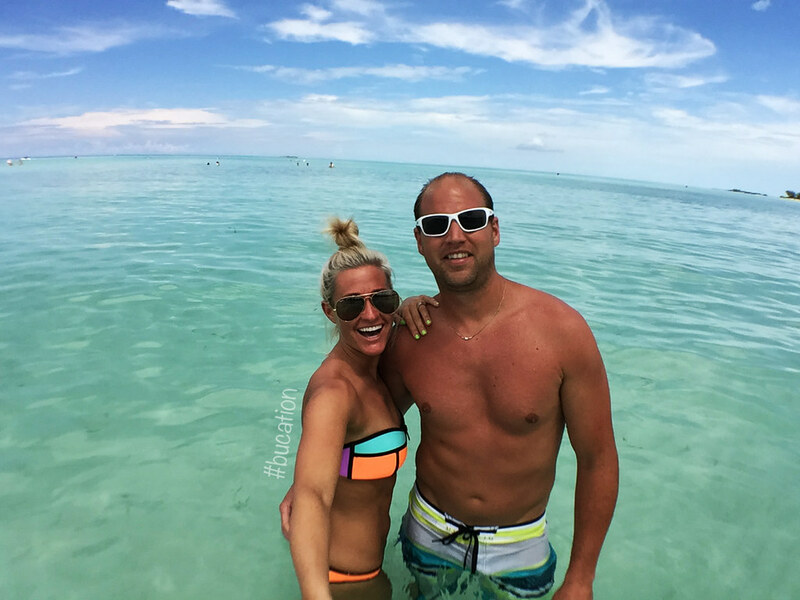 After all, we were on island time now with nothing but sunshine and cold drinks on our mind. By the time we arrived at Serenity Bay, more of our fellow cruisers had disembarked and arrived at the adult beach, but we had no problem finding beach chairs. The white sand cabana-lined beach was beautifully maintained, and there were a number of servers available to bring you cold beverages from the nearby bar. The restrooms, an open-air beach-front bar, and the adult barbecue are all located conveniently at the entrance to Serenity Bay. Serenity Bay has its own adult version of the Castaway Cay barbecue lunch. The same menu items are offered to all cruisers including cheeseburgers, hot dogs, chicken sandwiches, and ribs. During our visit, we ate lunch in one of the barbecues located near the family beach. Since all of the meats are grilled while you wait, and most of our fellow cruisers seemed to spent their day at the family beach, the lines were quite long. In strong contrast to the separate adult barbecue, this area was packed. If everyone in your party is an adult, we highly recommend you eat lunch at the barbecue on Serenity Bay. The family barbecue area was overcrowded with long lines and limited seating, and we would’ve much rather preferred (when we saw how calm it was) the adults-only barbecue. We chatted with two of the wonderful waiters who are some of the current 90-140 residents of Castaway Cay. These lucky two are just some of the few who get to live in paradise for a few months at a time. 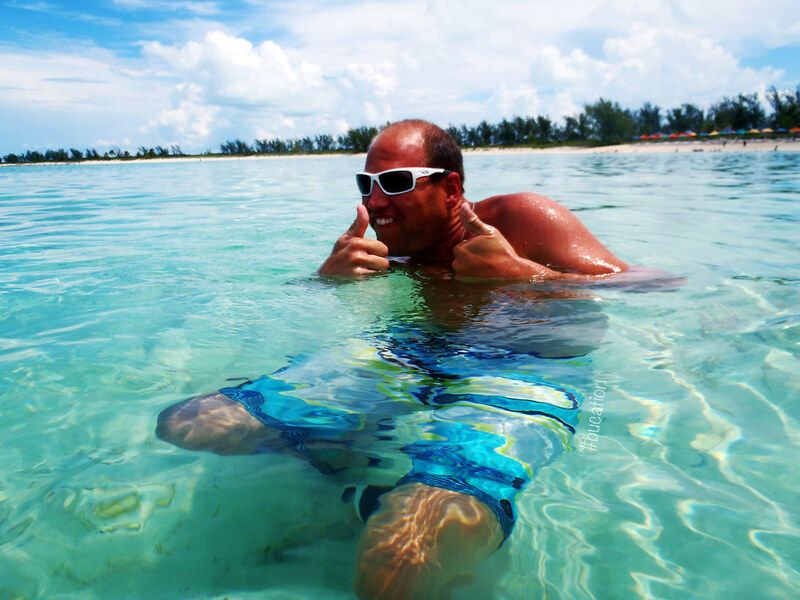 Castaway Cay is somewhere we would have no problem being on a permanent vacation – Sign us up! Some of their responsibilities include maintaining the beach, common areas, and making sure everything is perfect for when the cruise ships arrive at port. There were morning yoga classes as well as thai chi taking place at the far end of Serenity Bay. Tubes and floats were available to rent and relax the day away in the tranquil waters of Serenity Bay. Travel note: From the bicycles to the rafts and snorkel equipment, we came to discover that everything to rent on Castaway Cay was $10.00. After lunch we headed to the family beach. 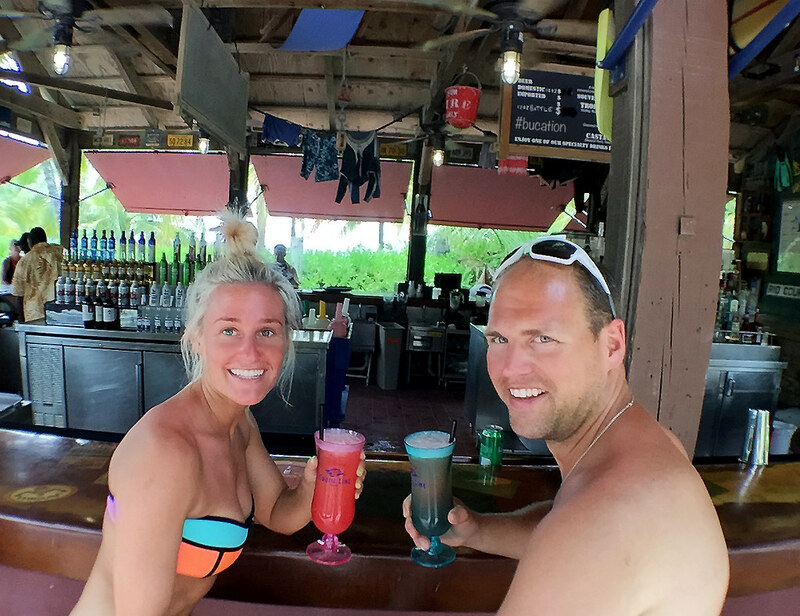 Along the way we grabbed a few Paradise Punches at Pop’s Props and Boat Repair bar which is located not far from the family beach. This large wrap around bar is located right off the walking path and within easy access to the family beach. Afterwards, we explored Boat Beach were watercraft rentals are available and we visited Castaway Ray’s Stingray Adventure. 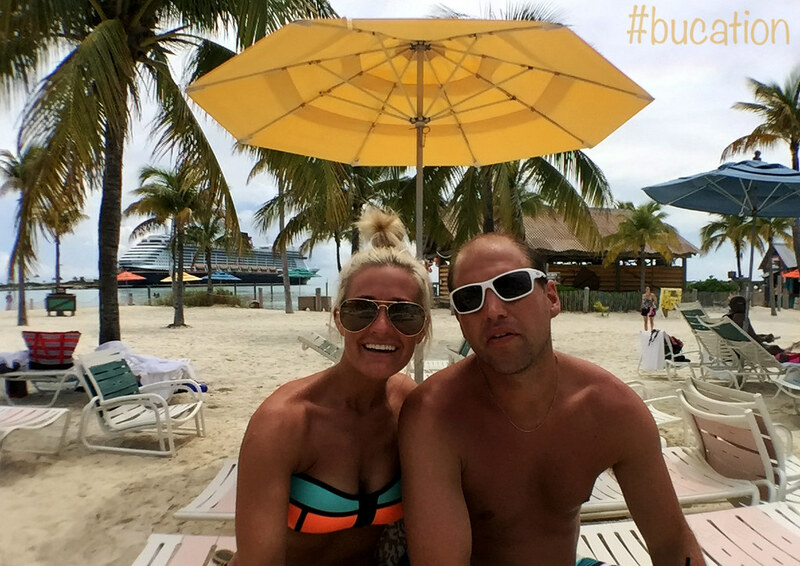 Since there wasn’t enough time on our first visit to experience everything Castaway Cay has to offer, we are looking forward to our next visit. We’ve added the Sting Ray Experience to our list of “must-dos” for next time. The music loop throughout the family beach area featured Jimmy Buffet’s greatest hits which is one of the reasons we spent as much time in this area as we did. There was also a disc jockey near the Hideout (which is a teen area) who was playing more current charting dance and pop hits. Castaway Family Beach is much more of a beach bash atmosphere than the quiet and calm Serenity Bay, and we were surprised to find so many available beach chairs this late in the afternoon (around 2:00 p.m.). Kudos to Disney Cruise Line for providing the option between the two beaches. Serenity Bay was perfect for our early morning, but after lunch we were ready to enjoy the island jams of Jimmy Buffet, cold cocktails, and the great conversations of our fellow cruisers. It is worth noting that Serenity Bay, at least on our visit, was not the soft white sand beach we pictured. Disney Cruise Line made it a point to specify that they do their best to maintain the natural habitat of this island paradise which we really appreciate. For this reason, they kindly ask that you not take any “souvenirs” home with you including sea life, plants, etc. However, along with this protected ideology comes what some may view as a stunning seashell-covered beach while others interpret this as a beach laden with sharp skin-piercing items and feel the need for water shoes. This was not a problem for us in anyway, and we honestly found the natural beauty of Serenity Bay charming. 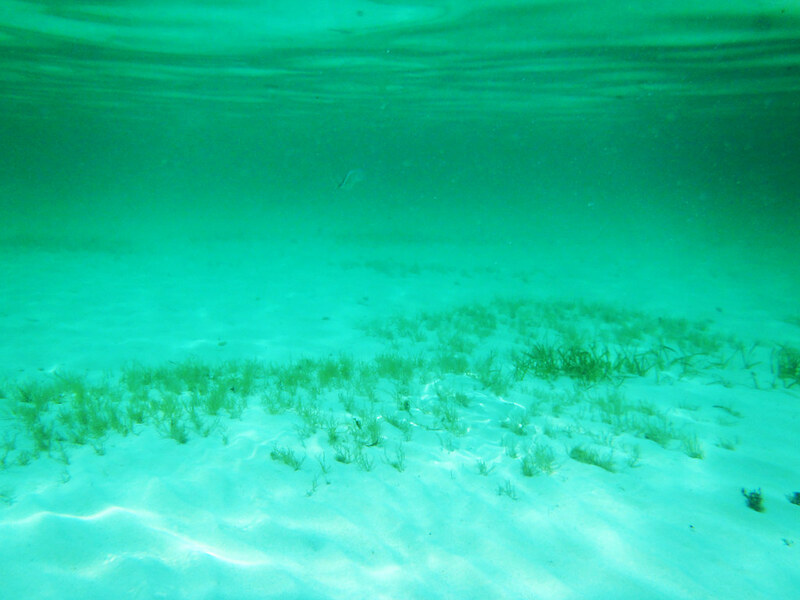 However, we found there were a number of our fellow cruisers who preferred the family beach for this reason, and they did not see this as a natural feature by any means. 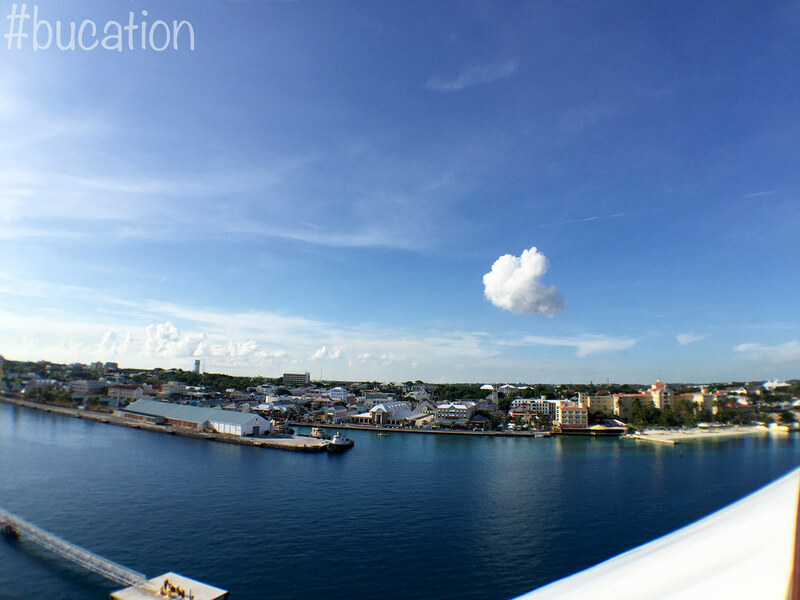 Since we had already explored Castaway Cay by land, we decided the next best way to tour would be by air. We booked a parasailing excursion for late afternoon which worked into our schedule for the day perfectly. 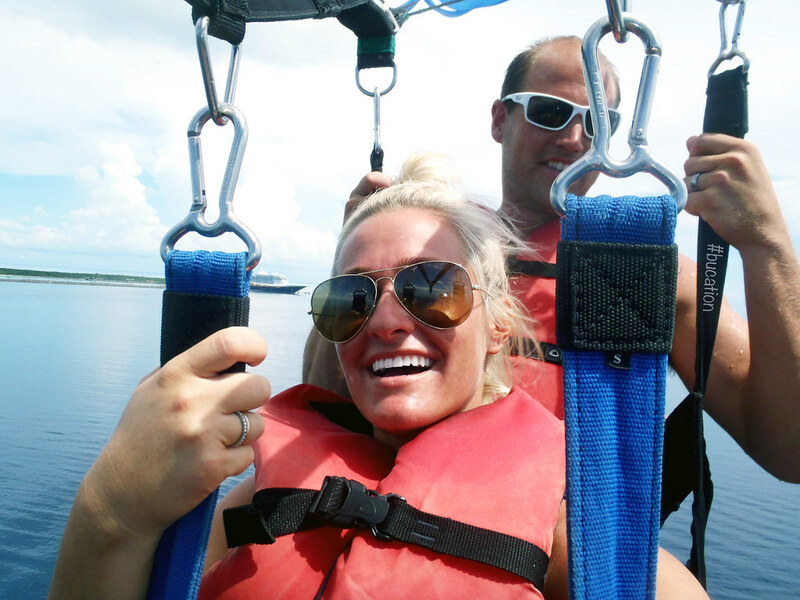 The parasailing excursion meets at Marge’s Barges & Sea Charters Dock which is adjacent to the port. After checking in at Marge’s kiosk, guests are directed to a nearby open-air waterfront lounge until their names are called. Our wait after check-in was not long at all. We had just enough time to snap a few pictures before we were on our way with six of our fellow cruisers. We had the option of riding in pairs (tandem) or as singles. 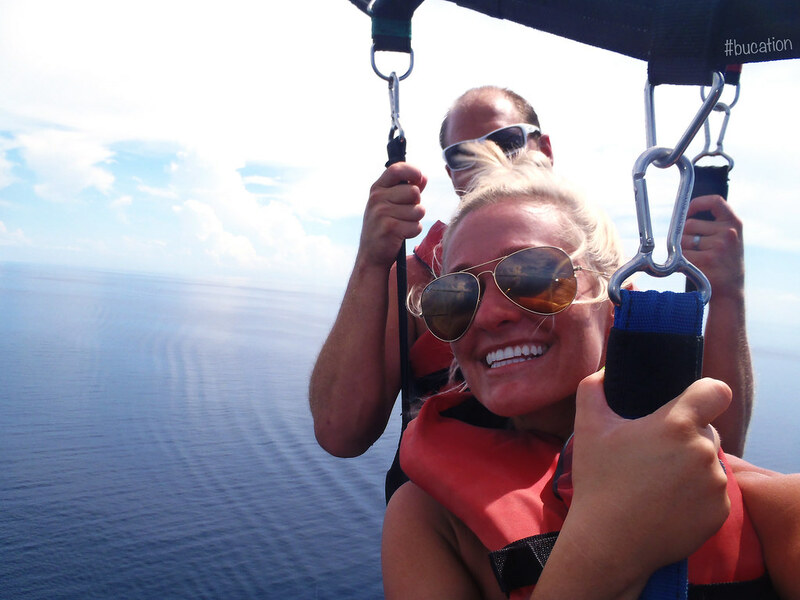 Only one person in our group took advantage of the solo option, and she really enjoyed her time flying the Bahamian skies solo. Our parasailing boat was one of two boats out on the water at the same time. Our boat took the beach side of the waters, and the second boat flew its passengers on the more underdeveloped side of Castaway Cay. 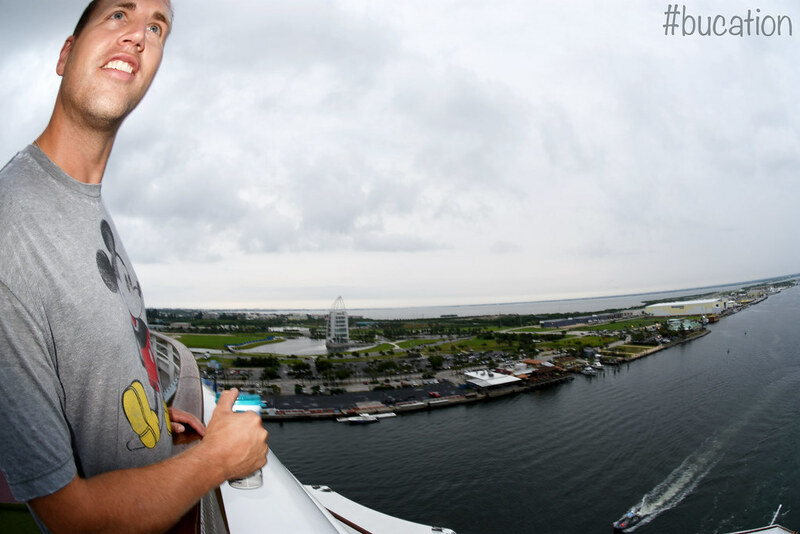 Either way, every rider had the opportunity to take in the fantastic aerial views of the Cay as well as of the fabulous floating paradise that is the Disney Dream. If you are height sensitive, don’t worry. We weren’t in the air for long, and those breathtaking views were worth every minute! 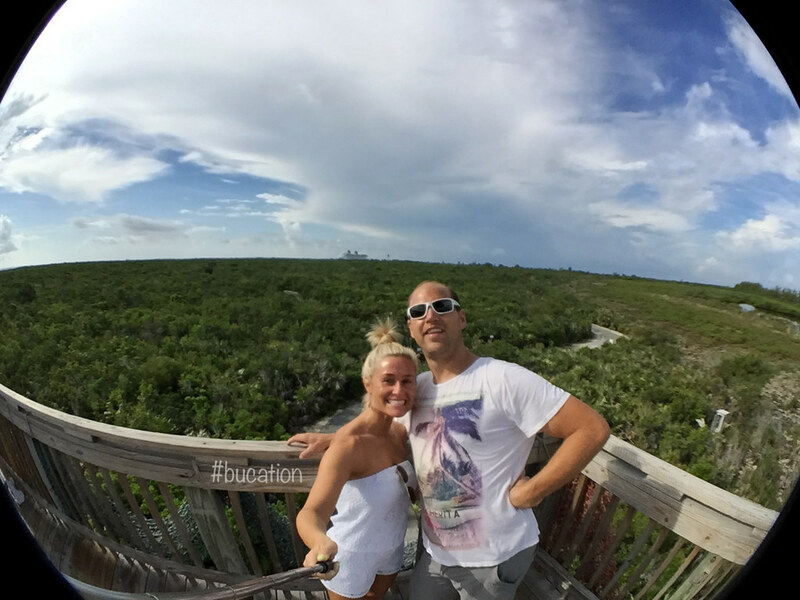 The entire excursion lasted about one hour, and our parasailing adventure delivered unobstructed views of Castaway Cay, our stunning cruise ship, and of course the deep blue sea that we never would have witnessed otherwise. We had a fantastic parasailing experience thanks to Hershel and his crew who live on a nearby key in the Bahamas, and we absolutely would suggest this activity to future visitors of Castaway Cay. After parasailing tour concluded, our time on Castaway Cay sadly came to an end. 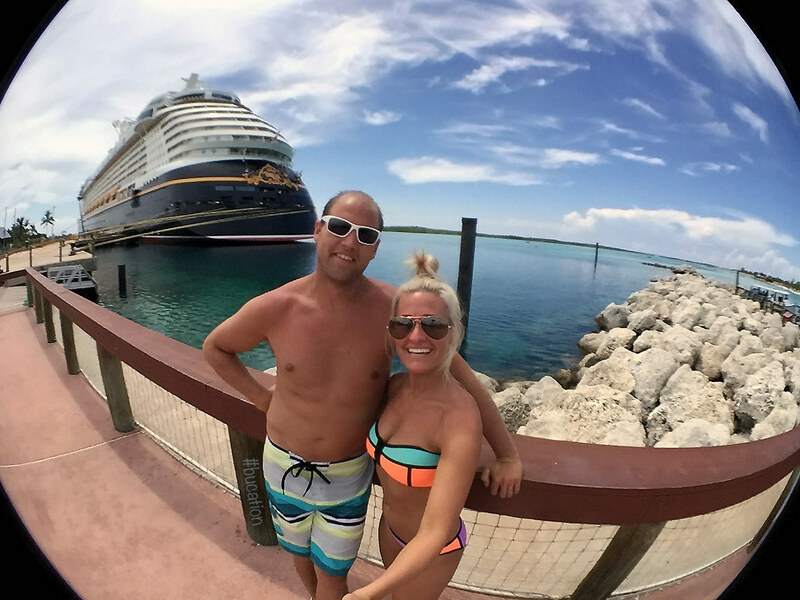 Although we were very happy to be back in Dream-land, we were sad to say goodbye to the tropical paradise that is Castaway Cay. We truly believe the purchase and development of Castaway Cay is one of the best decisions the Walt Disney Company has ever made. 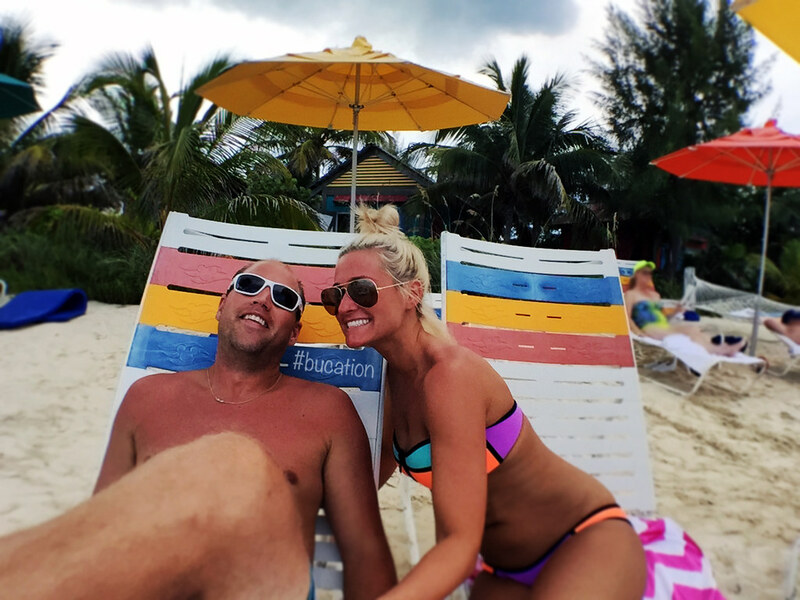 We were so glad our cruise itinerary included a stop at Castaway Cay. The island is perfectly laid out with endless activities, and there is a flawless balance between family and adult where one does not impede on the other. We look forward to visiting this beautiful island again in the future, and we hope that the Walt Disney Company will continue to cultivate and preserve all of the natural charm of this Bahamian paradise in the years to come. 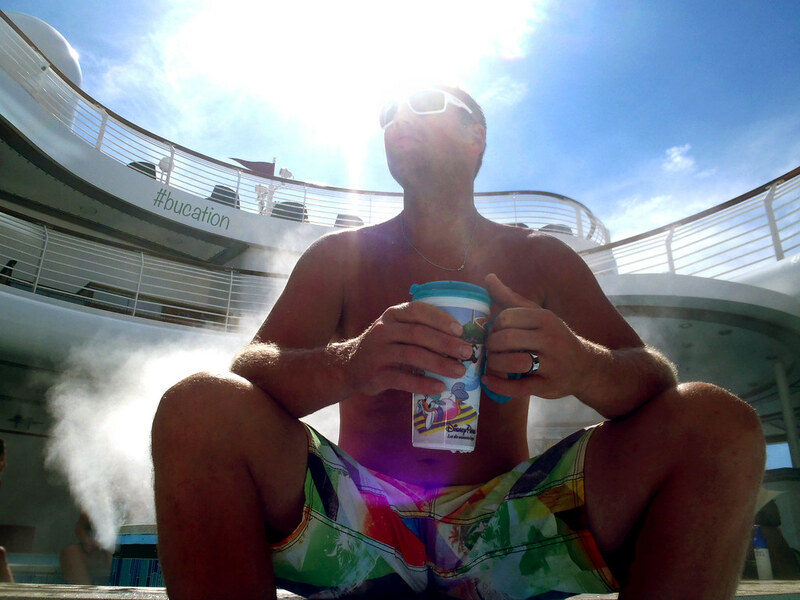 For our last afternoon at sea we found ourselves once again planted in The Cove Quiet Pool, and we shared a few drinks with a couple of our fellow cruisers. 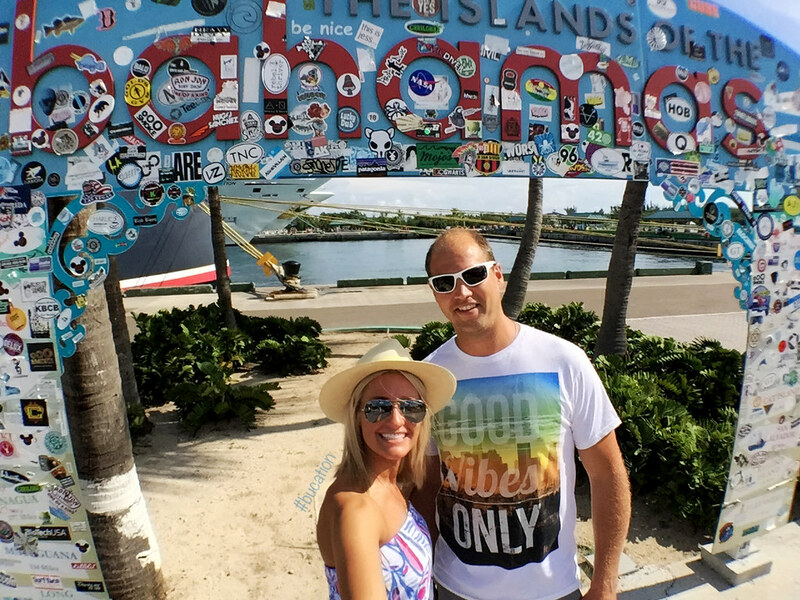 The morning may have started off with overcast skies, but the sunshine was out in full force for our afternoon at Castaway Cay as well as our afternoon at sea for our return to the Sunshine State. 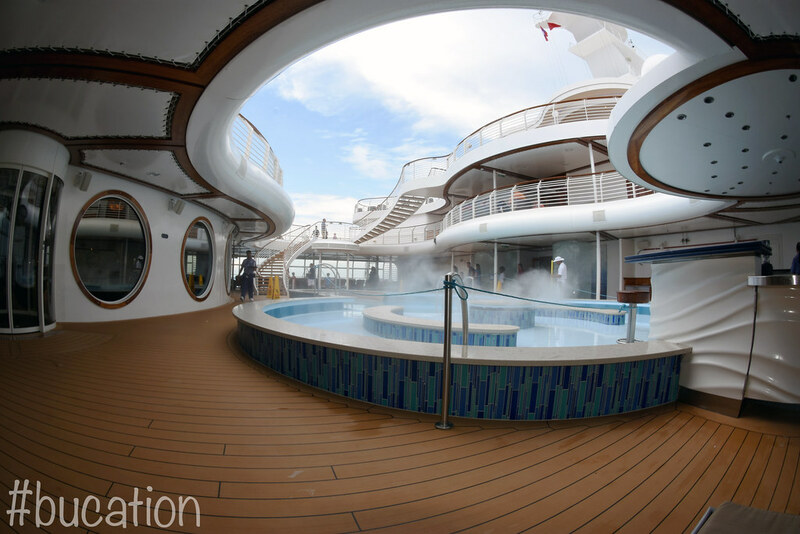 As the afternoon went on, and with everyone back onboard, more cruisers found their way to The Cove Quiet Pool. At one point it became so busy that we could barely move in the pool, so we made our way to Donald’s Family Pool for a more relaxing swim and a showing of one of our favorite of the Disney/Pixar movies, Ratatouille. During the movie we took a break to brave the long lines and ride the Aquaduck one last time just as it seemed everyone else was following suit. The ride was totally worth the wait, and we even ran into a few friends in line who we had met early on in our cruise. The Aquaduck queue allowed us to have one last chat before we all went our separate ways at disembarkment in the early morning hours. Our final night’s dinner seating was at the Animators Palette restaurant. 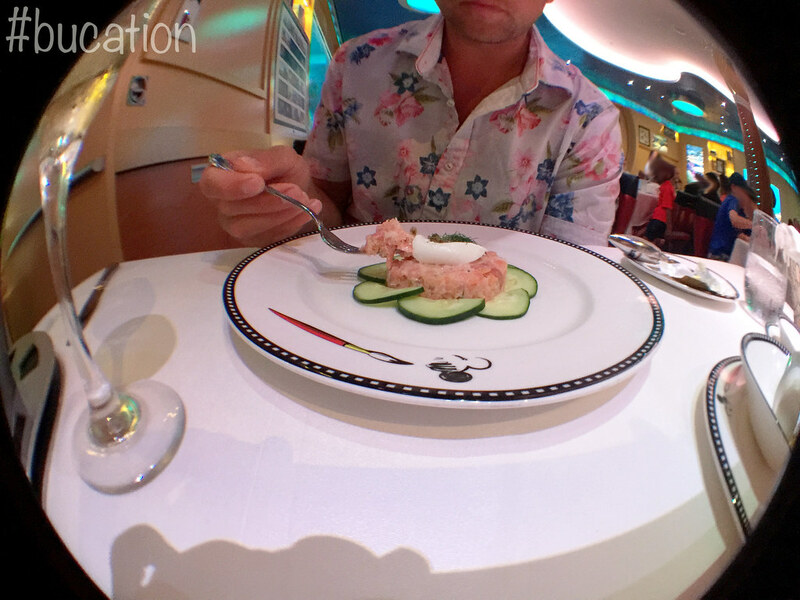 After chatting with our fellow repeat cruisers onboard we were really looking forward to our dinner at Animators Palette, and it did not disappoint! 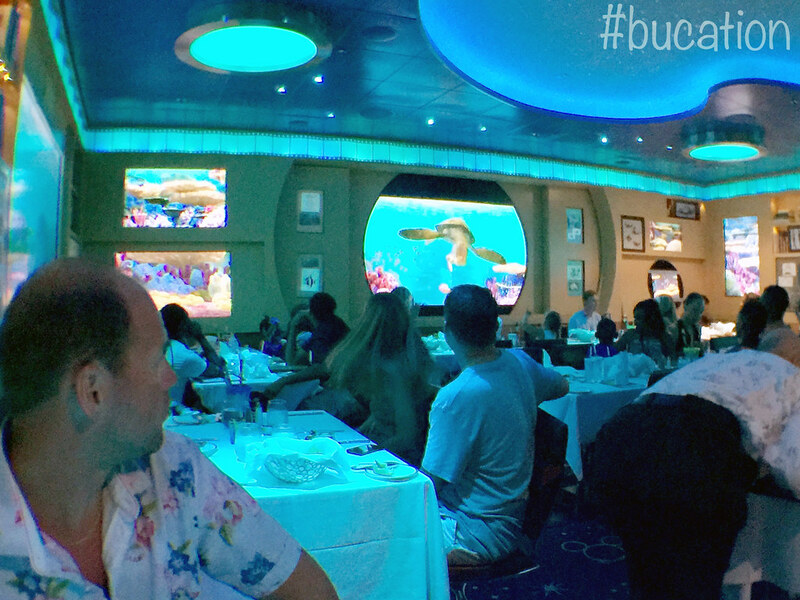 Our private table for two was not far from one of the restaurant’s interactive fish tanks, and the restaurants low blue-tinted lighting really made us feel as if we were under the sea along with Crush and all of his friends! We ordered the Black Truffle Pasta Purseittes and the Smoked Salmon Tartar for our first course. Both were excellent, but the Purseittes were out of this world delicious! Fresh pasta cooked to perfection, filled with a delicious truffle-scented cheese, and coated with a smooth champagne sauce. The sauce was a little taste of heaven. It was going to be hard to beat this, and we had only just begun our meal! For our next course we ordered the Creamy Butternut Squash Soup and the Baked Potato and Cheddar Cheese Soup with bacon. Again, both were pure perfection on a plate! The Black Truffle Pasta appetizer put us in a pasta groove so we ordered the Pennete Bolognese as one of our entrees and the Ginger Teriyaki dusted Angus Beef Tenderloin as the other. We were hesitant to order the Pennete since the description matched a similar dish that was served at the Cabanas lunch buffet, and although the buffet’s version was enjoyable we were looking for a different dish for dinner on this particular evening. To our surprise the Pennete arrived, and it knocked Cabana’s pasta dish out of the park with its rich Bolognese sauce, freshly shaved Parmesan Reggiano, and a toasted slice of garlic ciabatta! Our service on our last evening was impeccable. Since our table was adjacent to the service station, our glasses were never empty and we weren’t left wanting for anything throughout our meal. Our servers took extra time on our last evening together to make sure this dining experience with them was a special one, and it certainly was! We didn’t know what to expect with the interactive turtle tank show, but we never felt it was intrusive or took away from our dining experience in any way. The “show” has a lot of similarities to Turtle Talk with Crush in EPCOT at Walt Disney World, and it is not a continuous one. A number of the Turtle Talk Pre-Show “skits” such as the starfish sticking to the tank, and Mr. Ray swimming by can also be found in Turtle Talk With Crush. However, the amount of interaction between crush and the guests is nowhere near as much as Turtle Talk since that is a full show, and this is just a few short minutes of entertainment during your entire dinner seating. 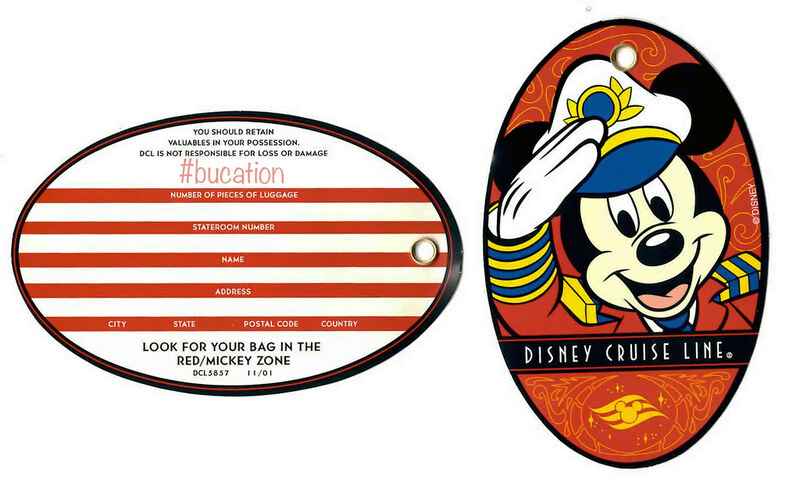 On your last evening you have the option to place your luggage outside your room and DCL will carry them off for you. Your bags will be waiting for you at customs, or you also have the option to carry your own luggage off with you in the morning. This is entirely up to each cruisers personal preference, and it is nice that Disney Cruise Lines provides you with the choice in this matter. 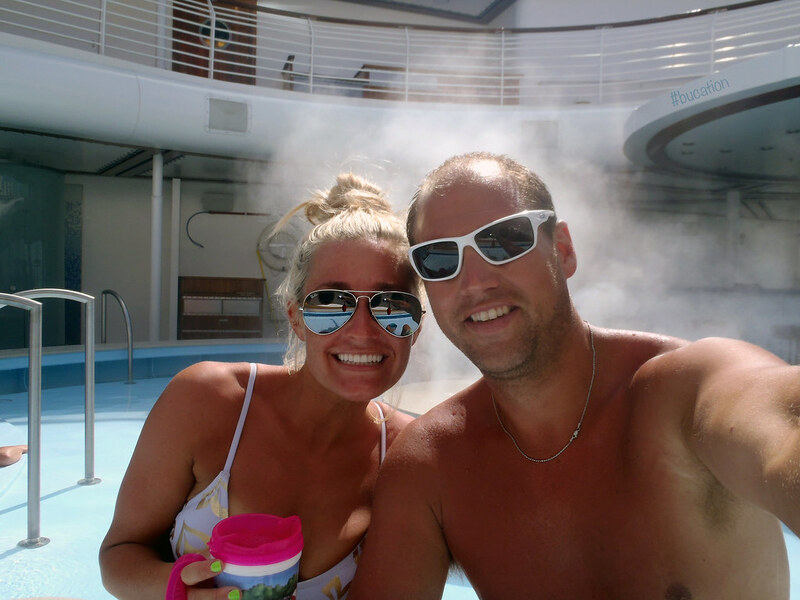 There are benefits to both options, and this is all detailed in the “Welcome to Port Canaveral” pamphlet that is provided in your stateroom along with the optional luggage tags. However, we weren’t ready to pack up and leave quite yet. We felt as if the packing of our suitcases meant the finality of the end of our Dream cruise would set in. In result, we decided to put off packing until the morning hours, and we carried all of our luggage off ourselves. After our fantastic final dinner at Animators Palette, we made our way to The District for one last hurrah! We spent the remainder of our evening at Evolution for 80’s Music Trivia and the What’s In Your Bag game. Most of the club was made up of one large bachelorette party, who were game for just about anything, and we really enjoyed watching them show the rest of us how to have a good time! Our host for the evening was very entertaining, and he did a great job of keeping things exciting. On this our final night aboard the Disney Dream, The District was packed. There were more of our fellow cruisers in The District this evening than we had seen on any other night during our cruise. Many of our fellow cruisers came out for their last evening aboard, but we never had a problem finding a table in a club or a seat at a bar. We ended our evening at Donald’s Pool with our last serving of Eye Scream for the highly anticipated showing of Frozen. When “Let It Go” began playing during the film, Idina Menzel’s voice echoed throughout the pool deck, and absolutely everyone young and old was singing along. We couldn’t think of a better way to end our Dream Cruise! When the morning of disembarkment arrived we packed up our suitcases, and we headed to Cabanas for one last breakfast on the aft patio. We filled up on all of our favorites one last time. Breakfast was also available on our morning of disembarkment at Animators Palatte, but since our cabin was so close to Cabanas we opted for the closer and quicker option. As we pulled into Port Canaveral the clouds were heavy, and a rainstorm had just moved into the area. Disembarkation went incredibly smooth. 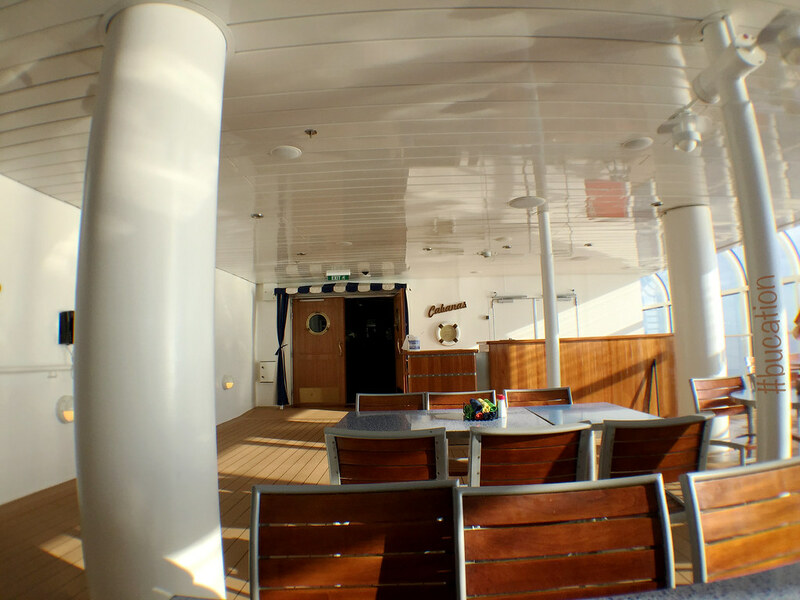 Once we crossed the gangway and we were officially off the ship, we entered into a large open room with tables of luggage organized to the right and customs official kiosks to the left. Staff were ready and waiting to help anyone who chose the luggage delivery service find their bags, but we were so glad we carried our own bags. It certainly made things go smoother in our opinion. There were two customs lines to choose from, and both moved faster than we expected. We were outside and on our way in no time. One thing worth noting is that there is no casino onboard the Disney Dream. Depending on your preferences, this could be seen as a drawback. However, for us this was a major plus. We are a major fan of casino-free cruise ships since this is something we have absolutely no interest in, and we would rather see this space used for something that everyone can enjoy. Onboard the Disney Dream, the various kids clubs, lounges, and sun decks make use of these would-be casino areas which allow for the separation of kids, tweens, and teens. In result, the adults can relax in the incredible adults-only areas while their children are enjoying themselves in their designated clubs, lounges, and private sun decks. We’ve always said you can’t do adults-only without also offering kids-only areas as well, and this formula works for everyone! During our research, we found a number of resources that included Disney Cruise Line in the same category as Carnival Cruise Line, Norwegian Cruise Line, and Royal Caribbean International. Although we have enjoyed our time aboard other cruise lines, we can say without a doubt that the level of service we received, the amount of included onboard amenities, the quality of food offerings, and the unique dining opportunities with rotational dining on the Disney Dream far surpassed any of our experiences on other lines. 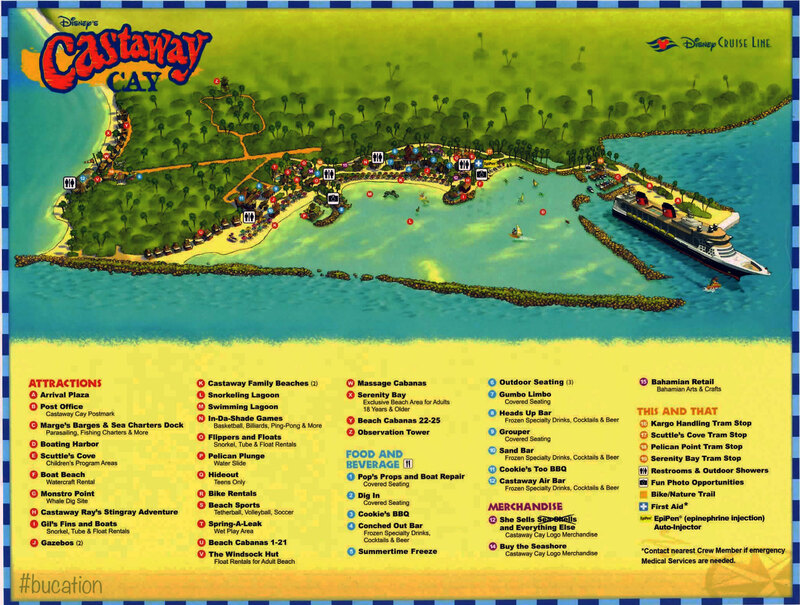 Disney Cruise Line’s private island required no tendering, and we were told it was an industry first to offer a full pier at their very own island. 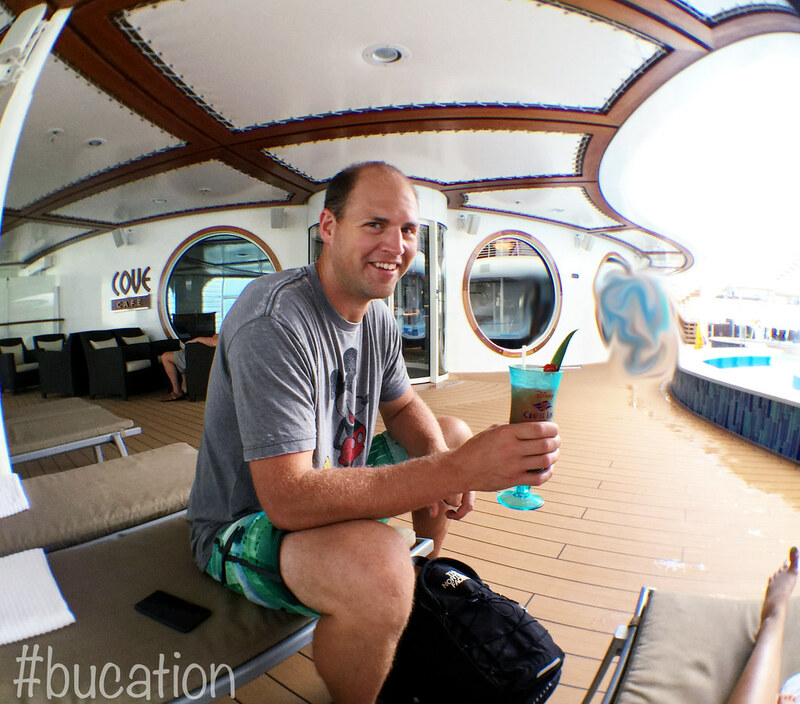 This Disney Cruise Line experience was truly a dream come true on the high seas. 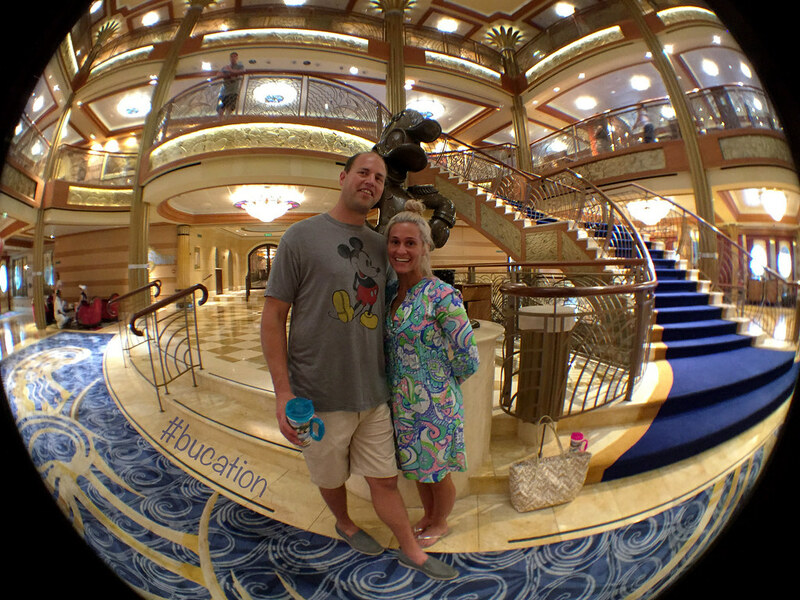 Our experiences with other cruise lines in no way can compete with the magic that is Disney at sea! 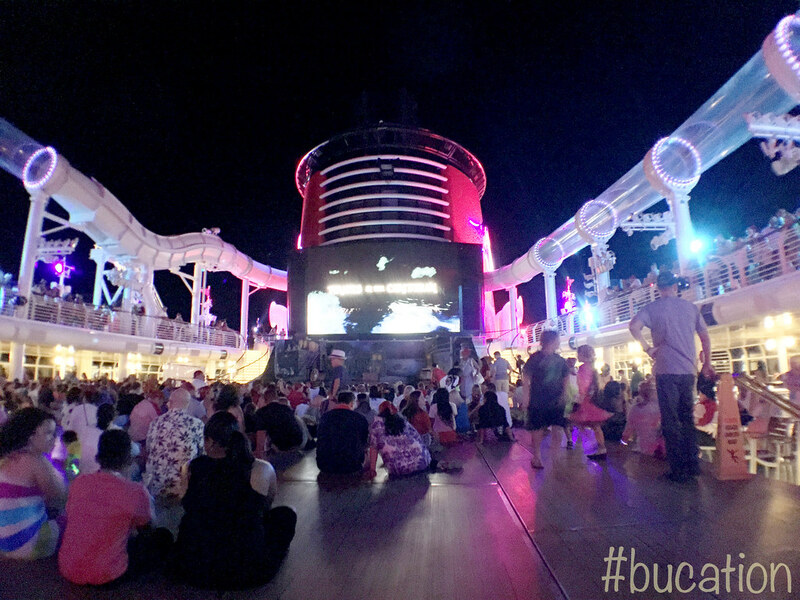 For all of these reasons and so much more, Disney Cruise Line has made repeat cruisers out of us and we are very much looking forward to our future sailings with DCL. 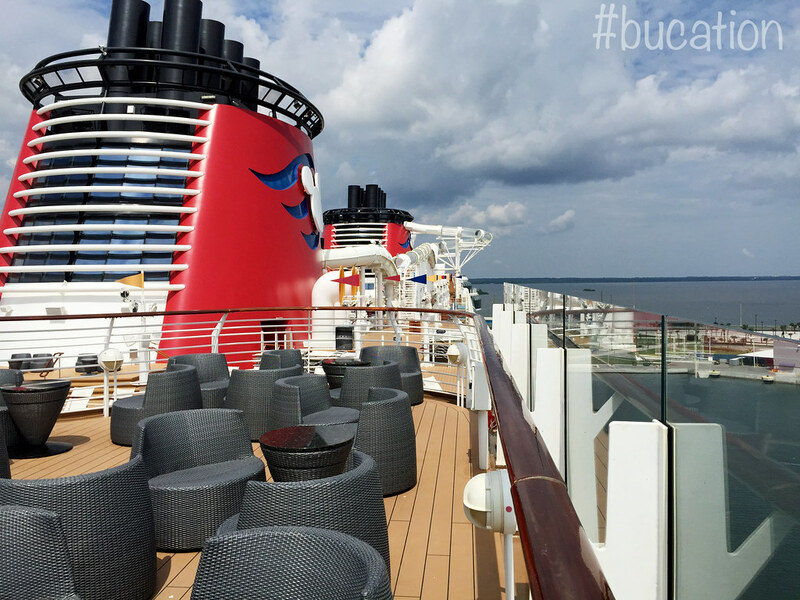 Have you had a chance to sail aboard the Disney Dream or are you planning a future sail on any of the other ships in the Disney Cruise Line’s fabulous fleet? 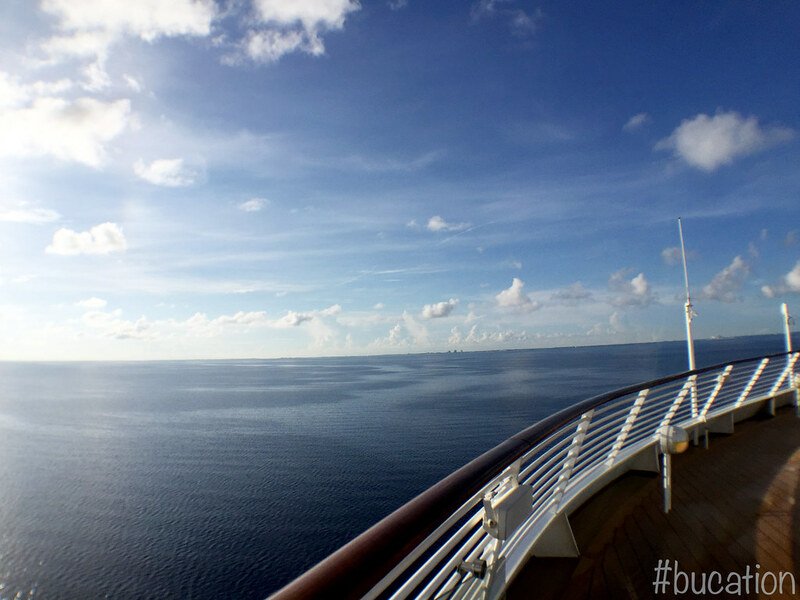 We’d love to hear about your past or future cruise plans, and we’re always looking for reasons to plan another cruise! 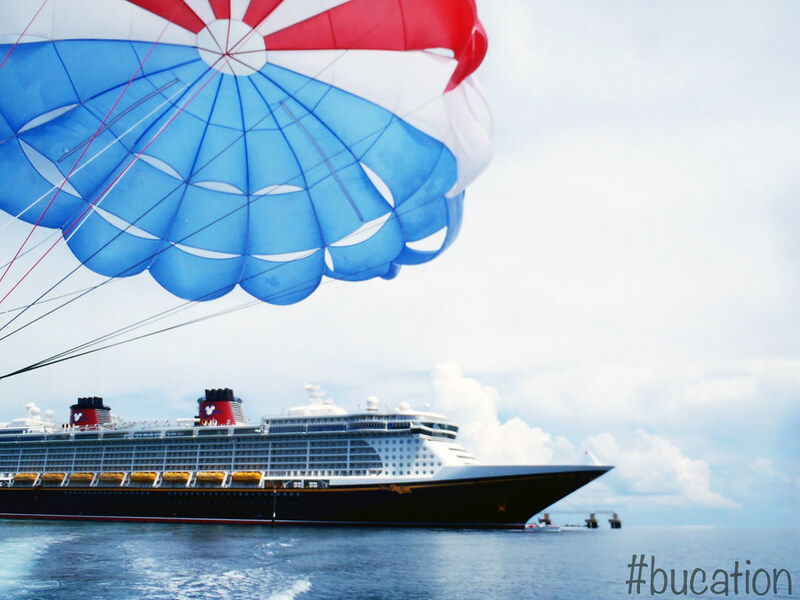 If you haven’t had a chance to sail with Disney Cruise Lines, we hope we’ve inspired you to consider sailing with DCL on an upcoming cruise and live the Disney Dream. You will not regret it! The comments, opinions, and views set forth on this site are the reflected personal positions of the site’s creators. This site is not an affiliate of Disney Cruise Line, The Walt Disney Company or any of its subsidies. 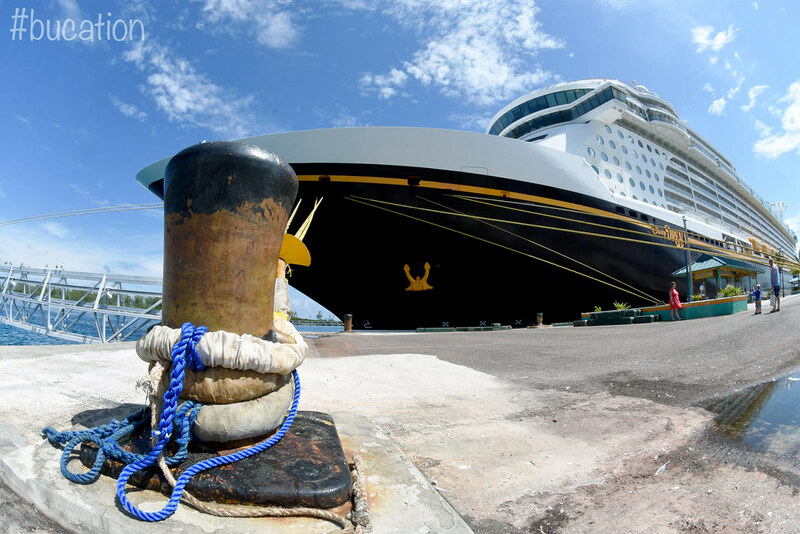 The comments, opinions, and views set forth within this site are not the official positions of The Disney Cruise Line or the Walt Disney Company, and they do not reflect the Company’s position. Thank you so much for the kind words Tricia 🙂 We also agree that a Disney Cruise Line vacation & a sail on board the Disney Dream never get old! 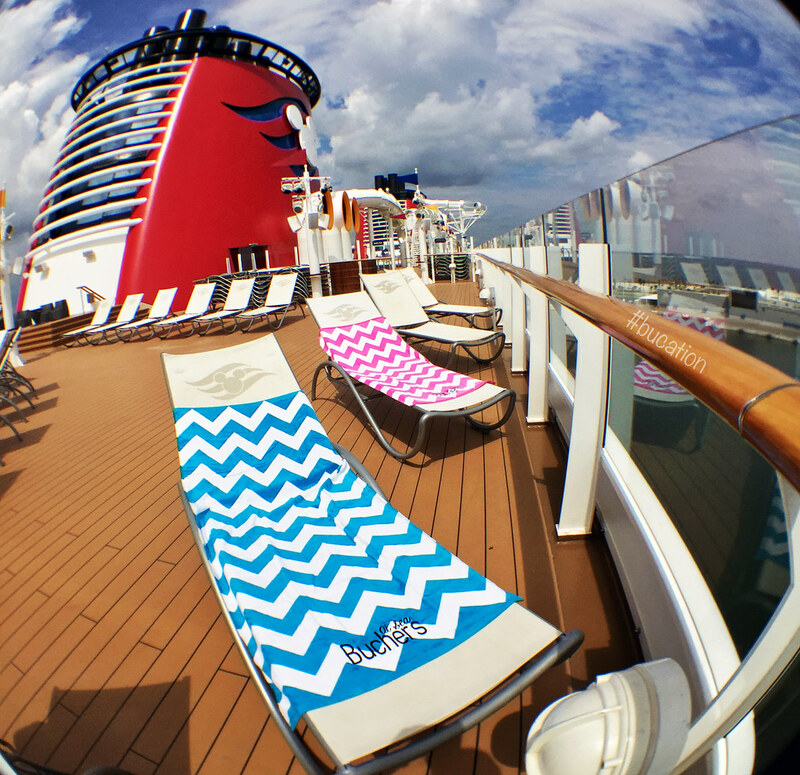 Have you had the opportunity to sail on any of the other DCL ships? If so, which one is your favorite?!? This was a fantastic (and spacious!) 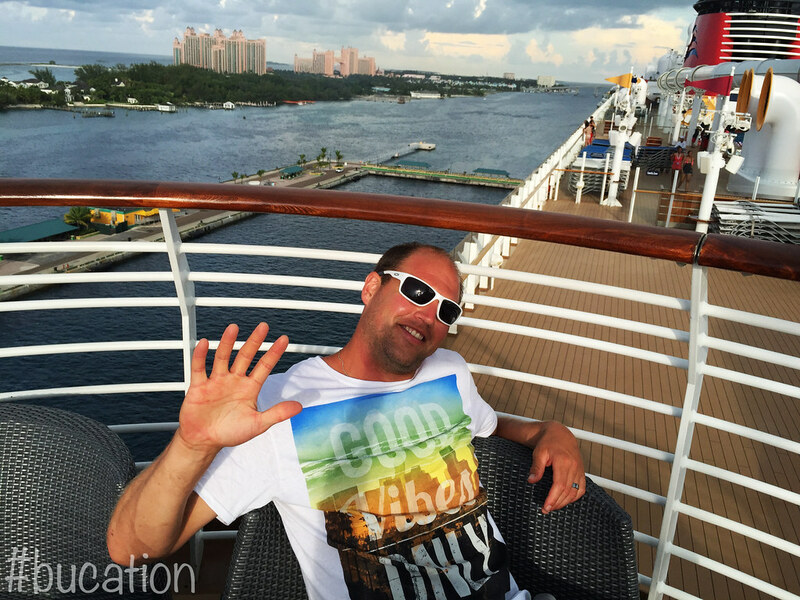 stateroom – you will not be disappointed! 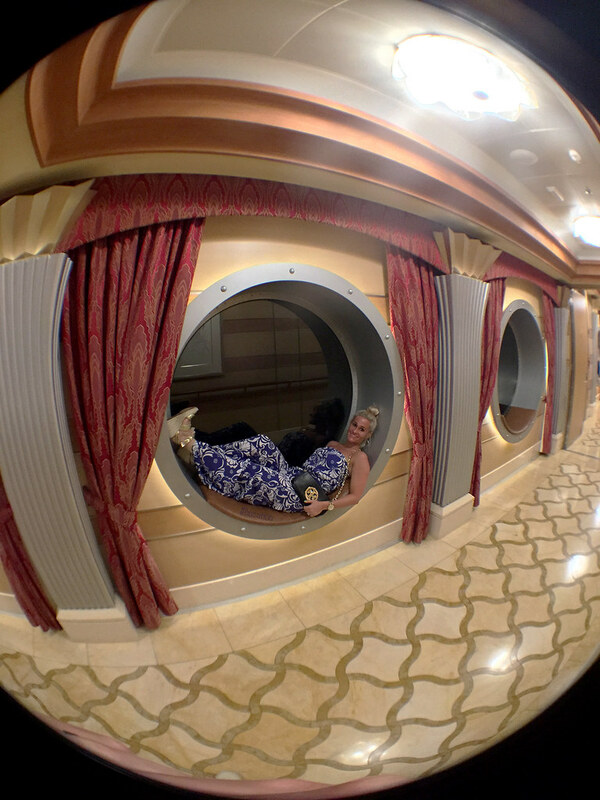 On any of your previous cruises with DCL, have you tried a concierge stateroom? Thank you so much for the offer! At the moment we do not have any guest posters, but when we do we will certainly keep you in mind 🙂 Please let us know your site so we can follow you as well!